I was recently near San Diego, California for filming. 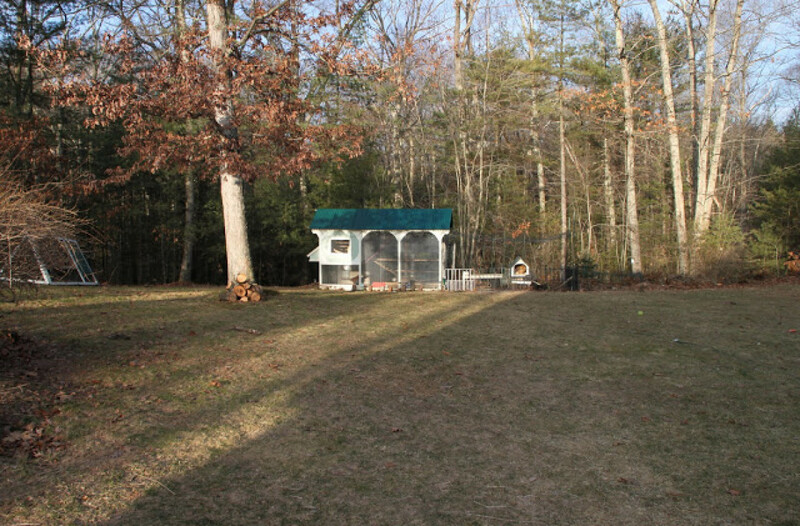 They chose to film on this amazing piece of property that featured a chicken cathedral style chicken coop. I had a chance to chat with Jean, the visionary and creator of the the coop. Not one detail was overlooked and it is a true work of art. 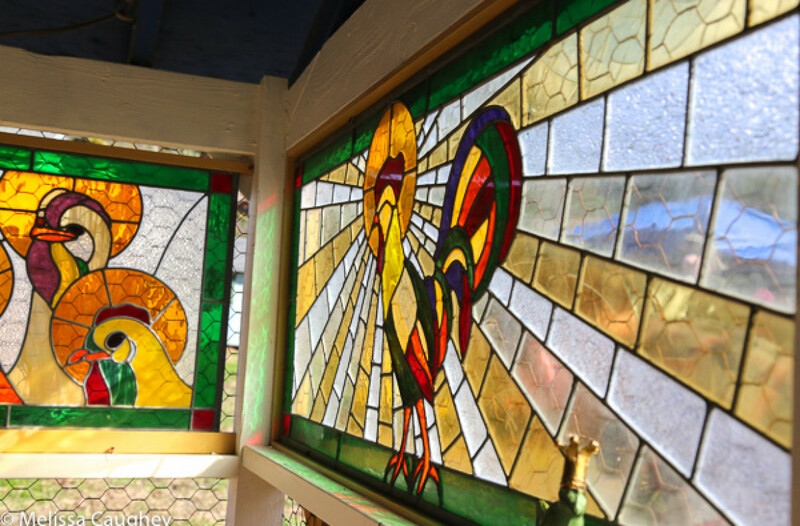 Take a peek at this marvelous chicken cathedral coop tour. I think you will agree that Jean is one amazing woman! Melissa has become a friend of mine that I met through social networking. Ironically, she only lives about 20 minutes away from me. 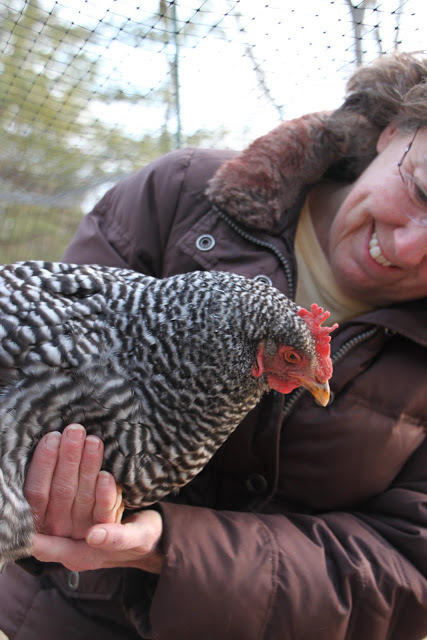 Our paths seemed to keep overlapping and I was thrilled to have been invited to her house to see her coop and meet the girls. 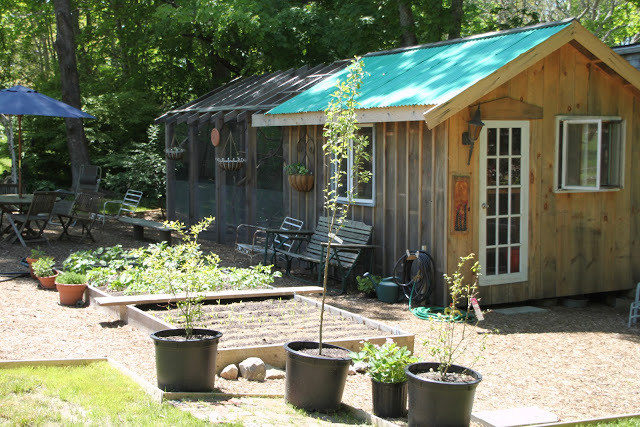 Tucked away in a corner of her backyard are her two beautifully made coops. Of course, like most of us, she started with the smaller one on the right and realized that she had to have more chickens and a larger coop. 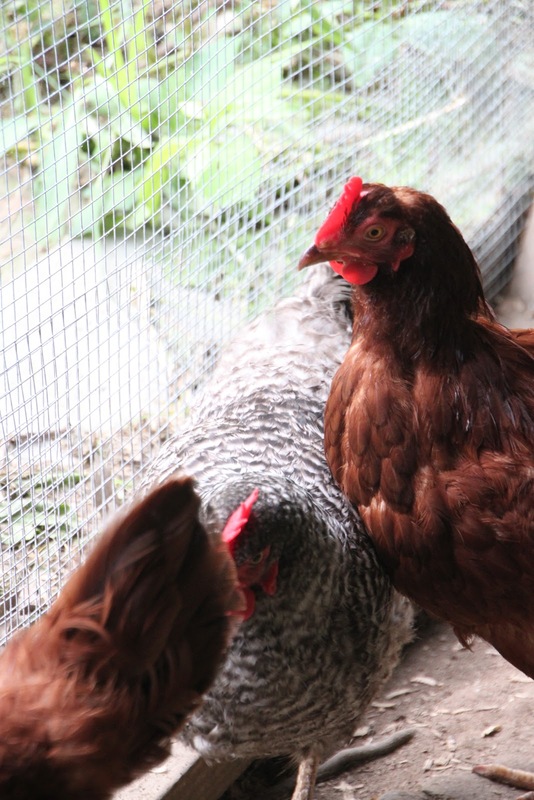 She is currently in the process of acclimating newer pullets on the right into her existing flock on the left. She keeps the runs divided with a pass through door in the center. 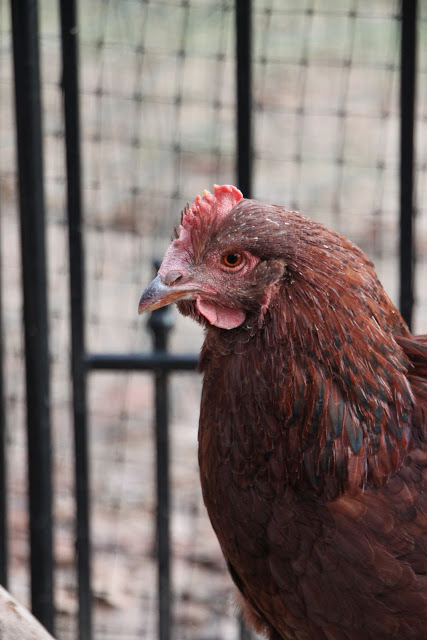 Immediately I was greeted at the gate by her beautiful flock. 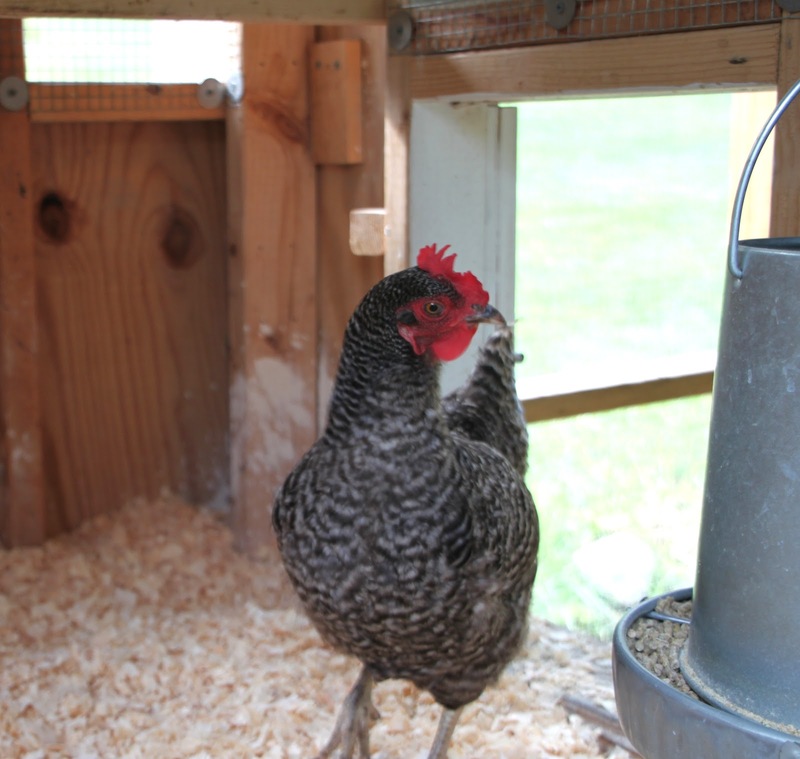 Each coop has plenty of nesting boxes for her hens. 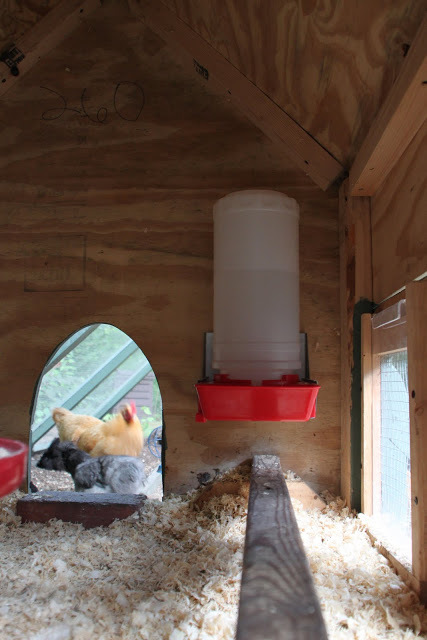 She uses hanging metal feeders and metal waterers. 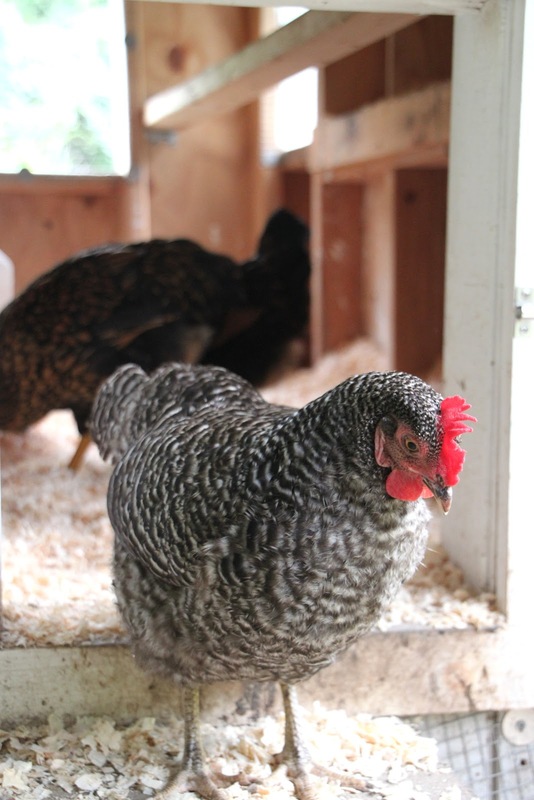 Pine shavings fill the coops and nesting boxes. Two of her older girls were busy laying eggs in the other coop. They were curious to see us take a peek under the lid. She also keeps her chickens locked up for safety. 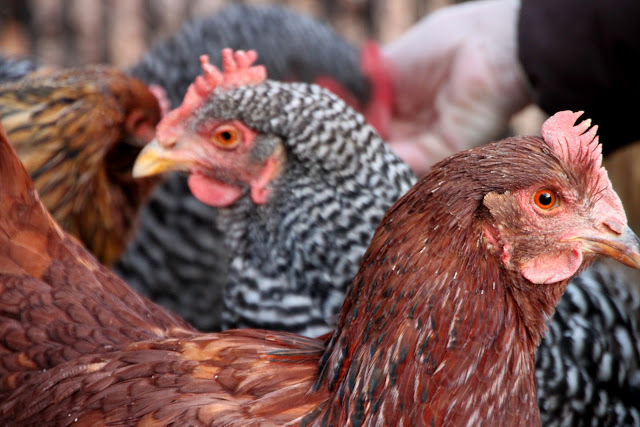 Believe it or not, people are listed as predators for chickens. 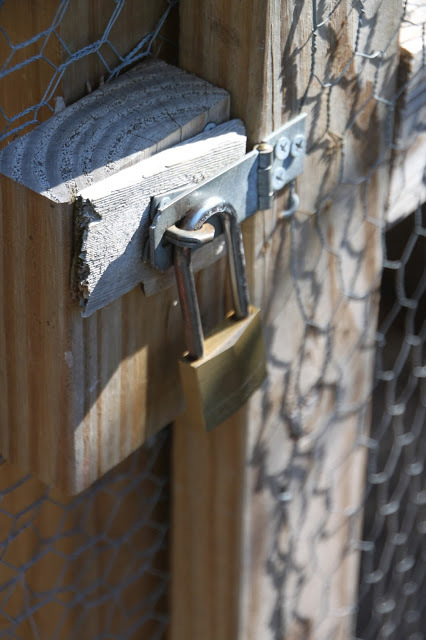 Sometimes, people will come into your yard and steal your flock. 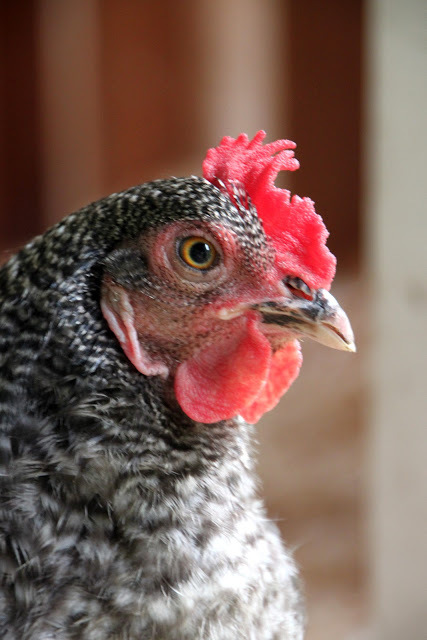 Her chickens are very docile and friendly. Most enjoy being handled and held. Melissa’s coop and run set up is thoughtful, practical and well thought through. 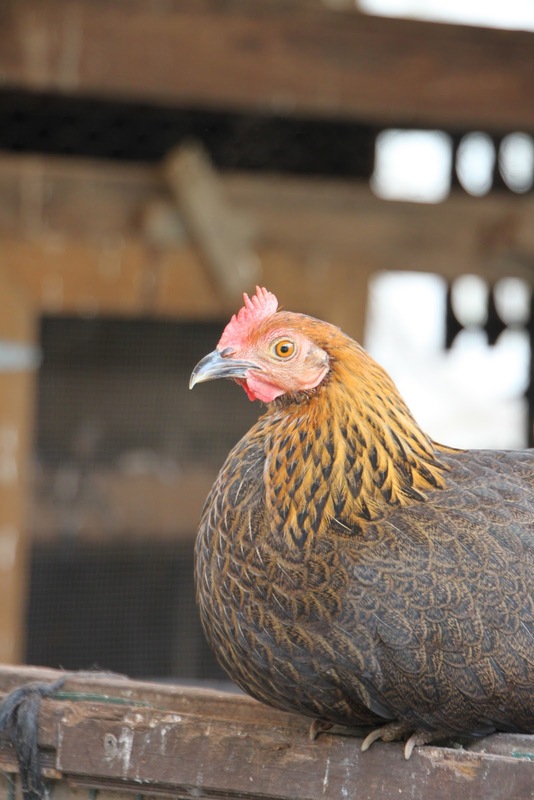 The runs are large with ample space for her two flocks with room to grow in the future. She treats them to scratch and treats during the day and there is a flock block in the run as well as a treat ball hanging nearby. 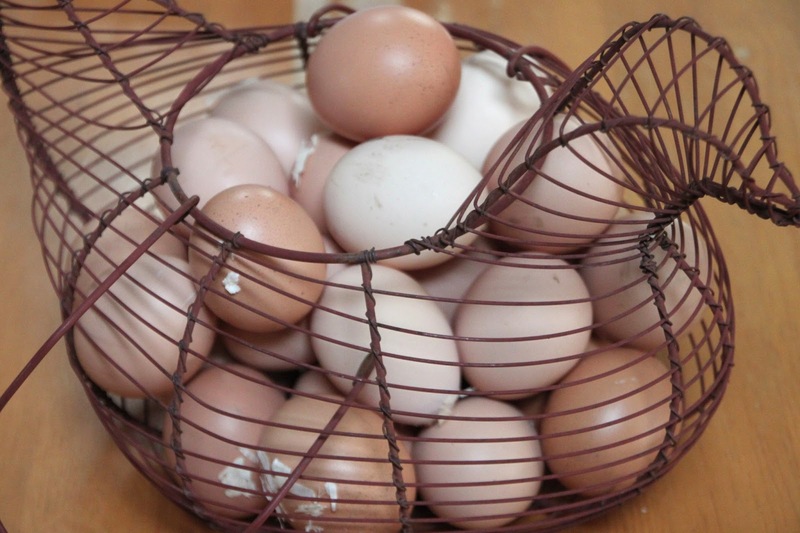 The best part are the eggs that Melissa is rewarded with on a daily basis. 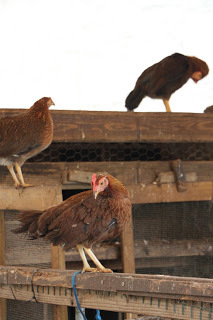 Click here for over 20 more coop tours. I met Mike two years ago when he came over to my house on business. 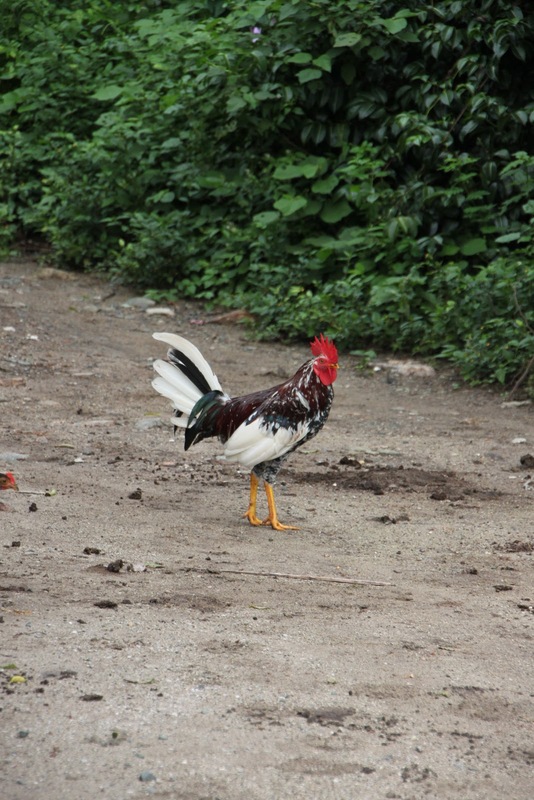 As he was leaving, he inquired about the chickens in the yard. 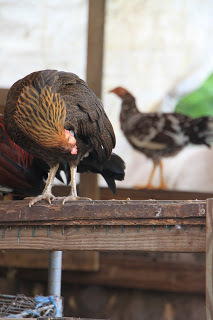 Of course, I had to take him over to the coop, introduce him to the girls and give him my 15 minute schpeel on the glory of keeping backyard chickens. 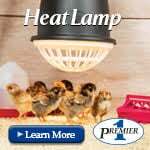 It wasn’t long until Mike emailed me to tell me the news, they were the proud owners of baby chicks! 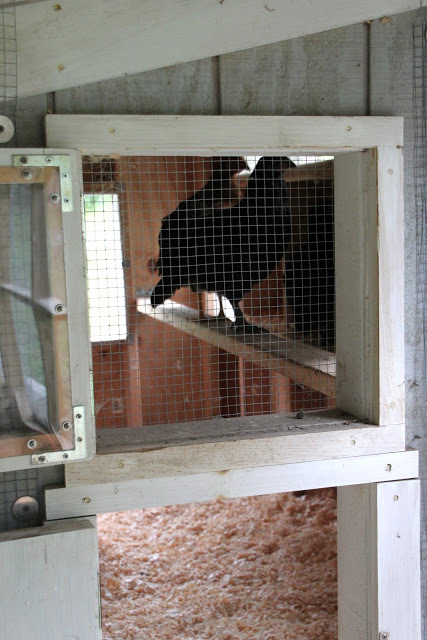 Mike soon sent me pictures of the beautiful coop he and his wife had made for their new flock. 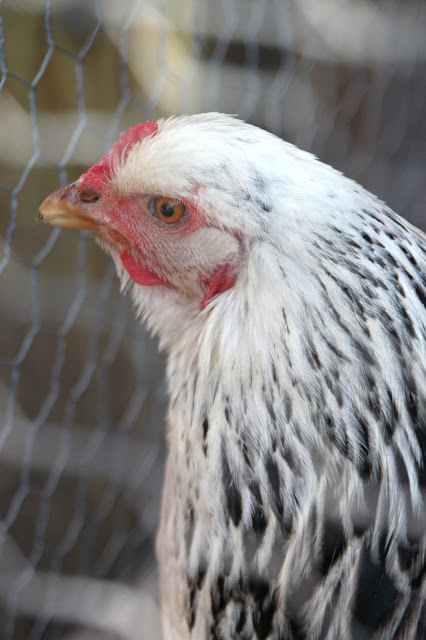 As time passed, they added new members and their flock has grew from four to ten. 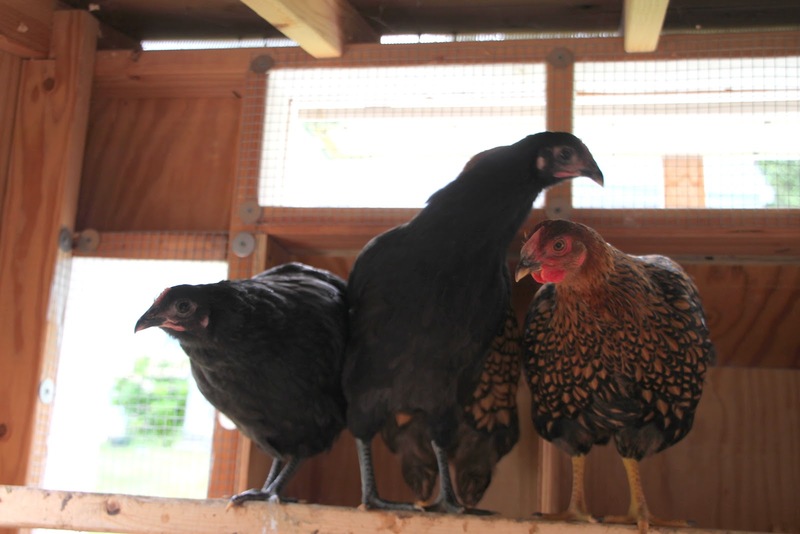 The chickens were officially members of the family with names to match their personalities and looks. 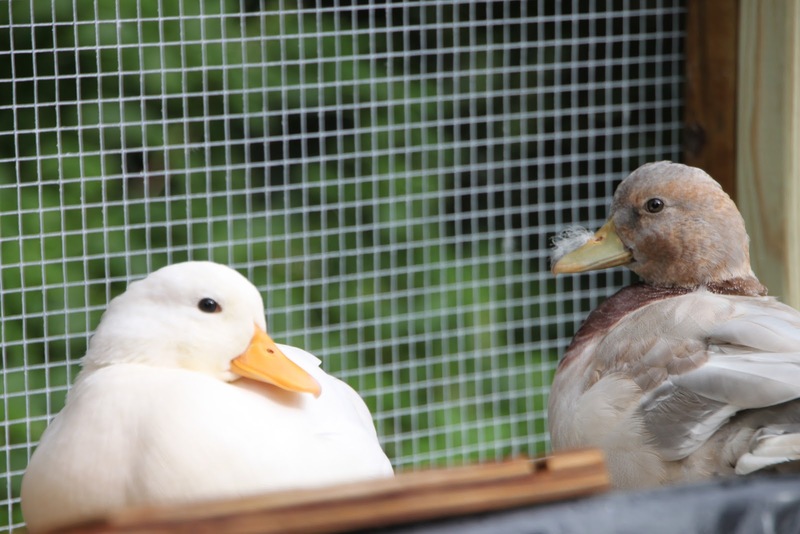 I was also happy to hear that, Mike and Wendy are now the proud parents of two call ducks, Fletch and Flash. 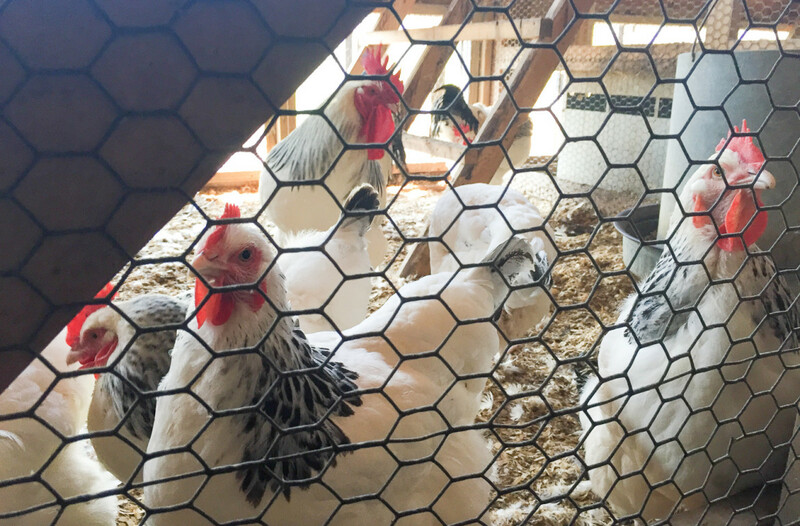 Yesterday, I was invited over to visit their human and feathered family for the first time. I was so excited to meet everyone. The yard is beautifully landscaped. 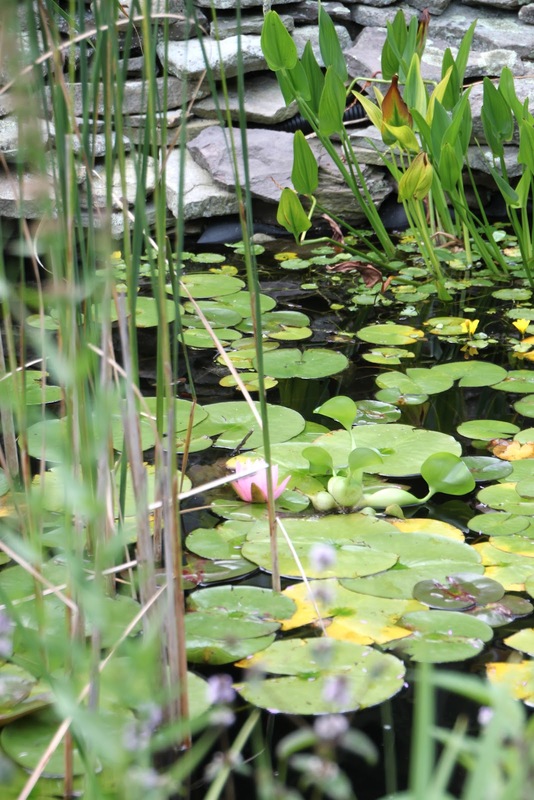 Fruit trees, a Kousa dogwood and a spectacular koi pond lace the property. The koi pond is gorgeous! The sound of the waterfall fills the air. 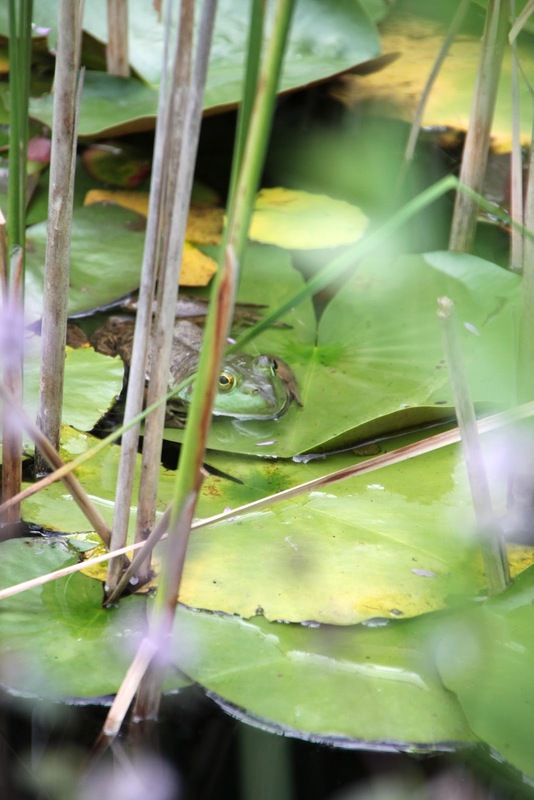 Lily pads, water hyacinth, cattails, assorted koi and the occasional bullfrog croak are all part of this magical oasis. 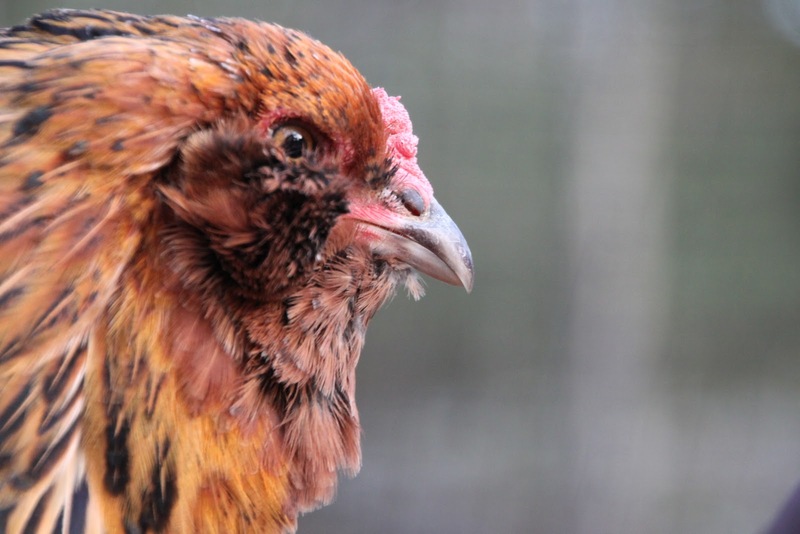 Their flock of ten chickens is a combination of Buff Orpingtons, Australorps, Rhode Island Reds, Barred Rocks and Golden Laced Wyandottes. With names like Patches, Honey, and Puddles, you can tell these chickens are well loved. 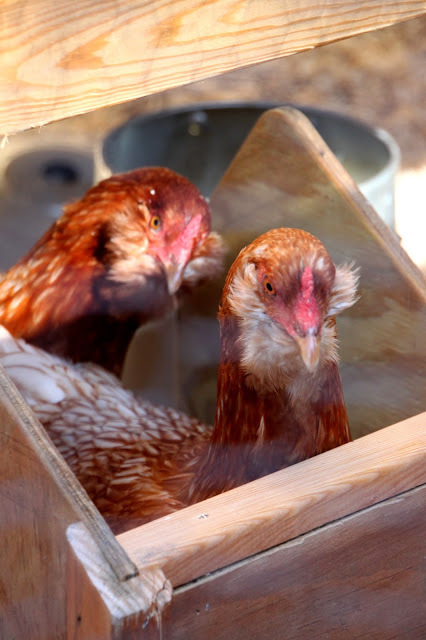 After researching many different internet sites and books, Mike and Wendy designed the coop, making sure that it had plenty of ventilation, windows and easy access for cleaning. 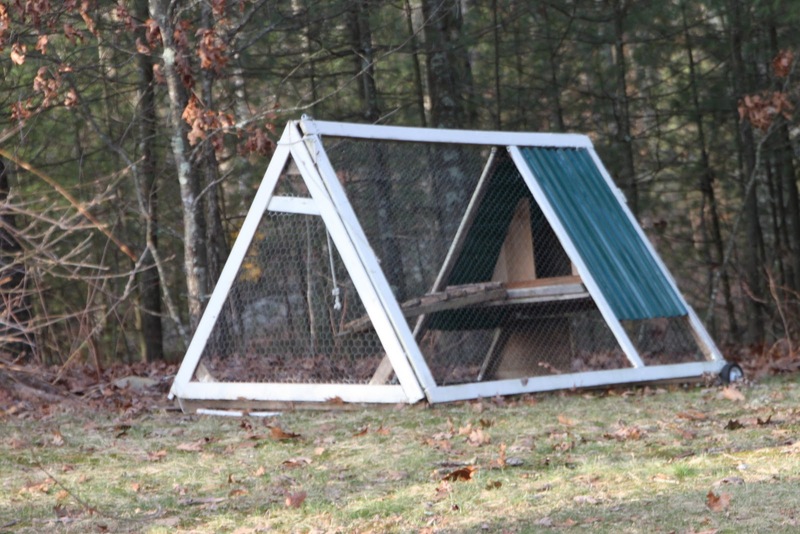 One of the challenges of building their coop is the slope of their backyard. 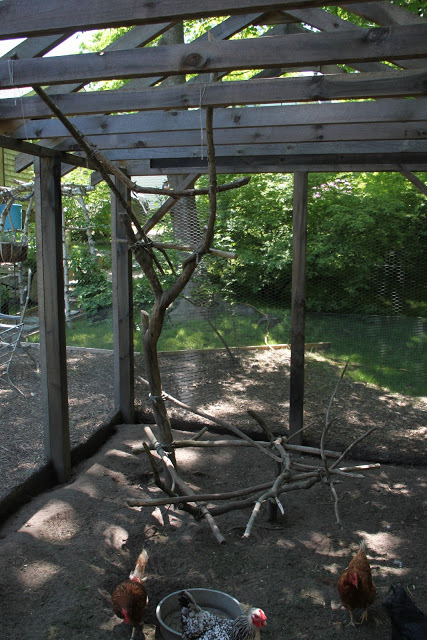 With a little bit of innovation, Mike and Wendy leveled the coop and built the run into the hillside. 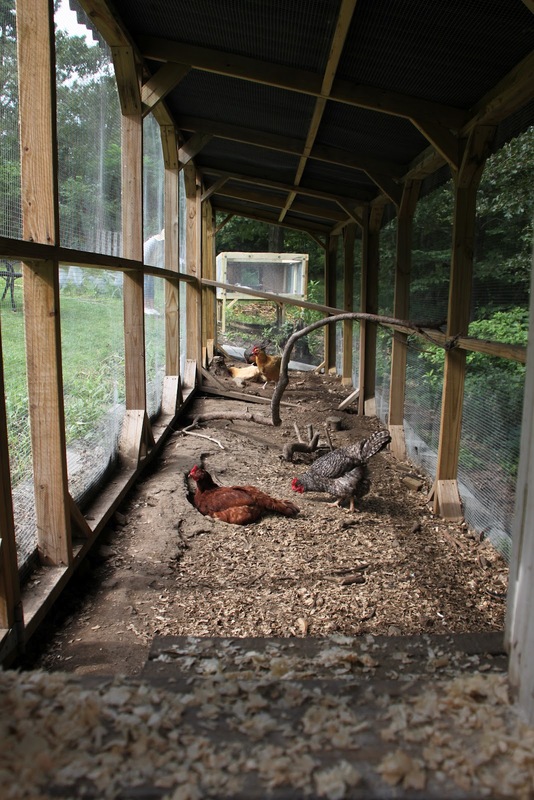 Inside the coop, there is plenty of room to roost and three nesting boxes. 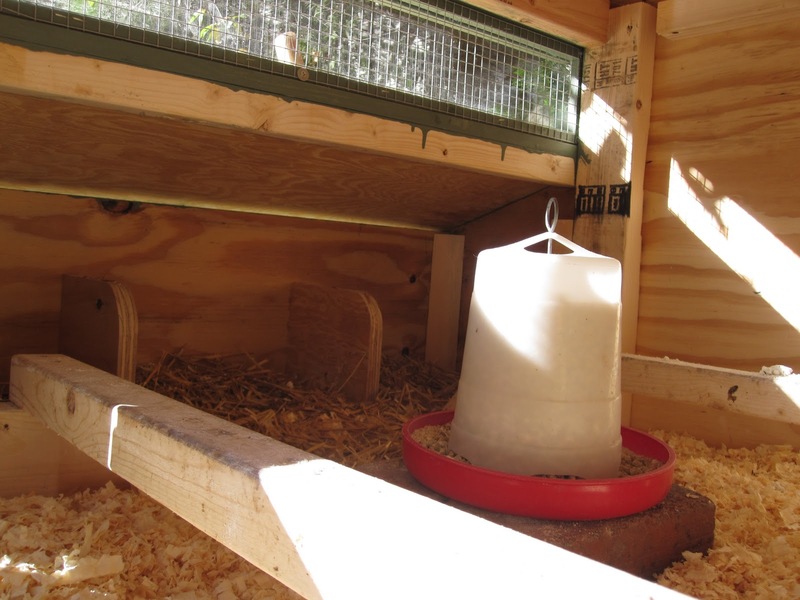 A large hanging feeder is in the corner and the waterer sits perched upon some blocks in the center. They created windows covered with plexiglass. I love this! 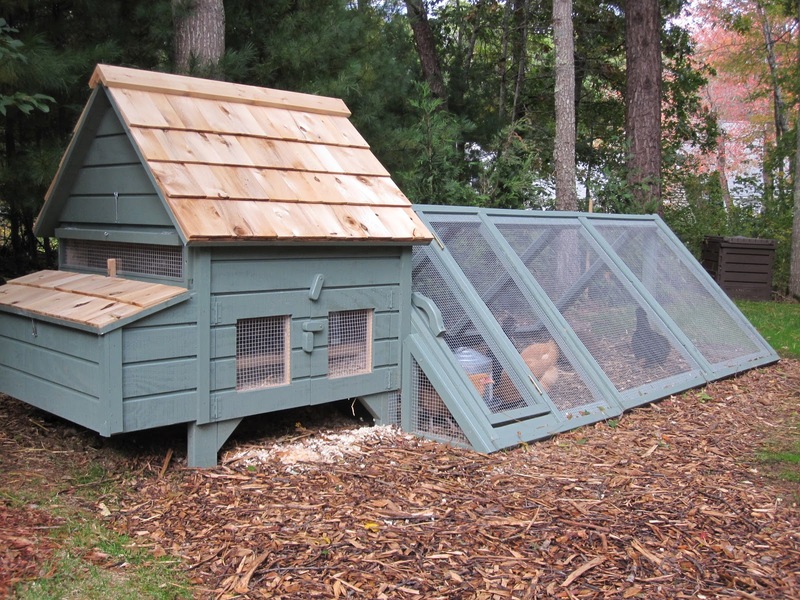 This coop has windows on three sides and all can open and close depending on the weather. They are screened with hardware cloth. 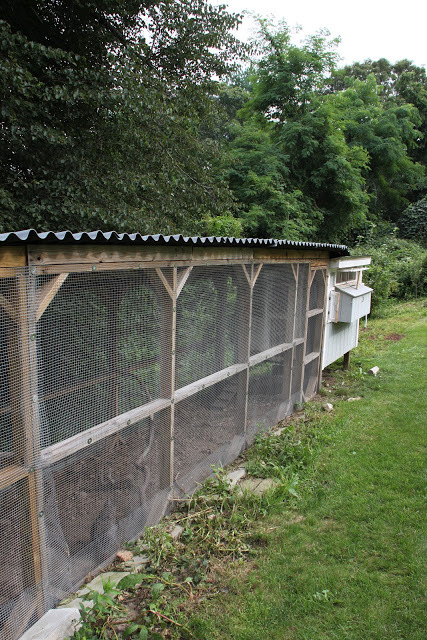 The run is over 32 feet long with the width matching the coop. 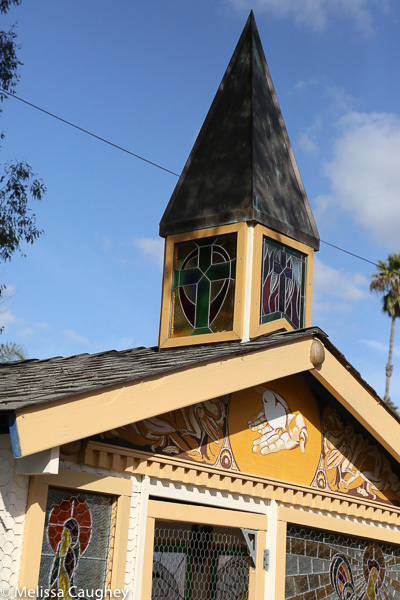 It was created in eight feet sections covered with a corrugated roof, pitched for snow and rain run off. The run is enclosed with hardware cloth. Hardware cloth also lines the outside perimeter of the run. These extra measures, help ensure that the run and coop are predator proof. Living in a wooded area, it is not uncommon to see coyotes and fox running through the yard as well as hawks overhead. All of the chickens are docile and gentle. 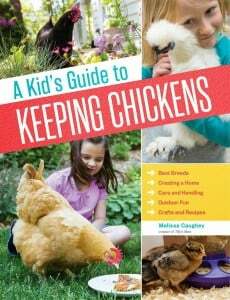 They are lucky enough to have chickens that love to be held by the kids and receive snuggles. 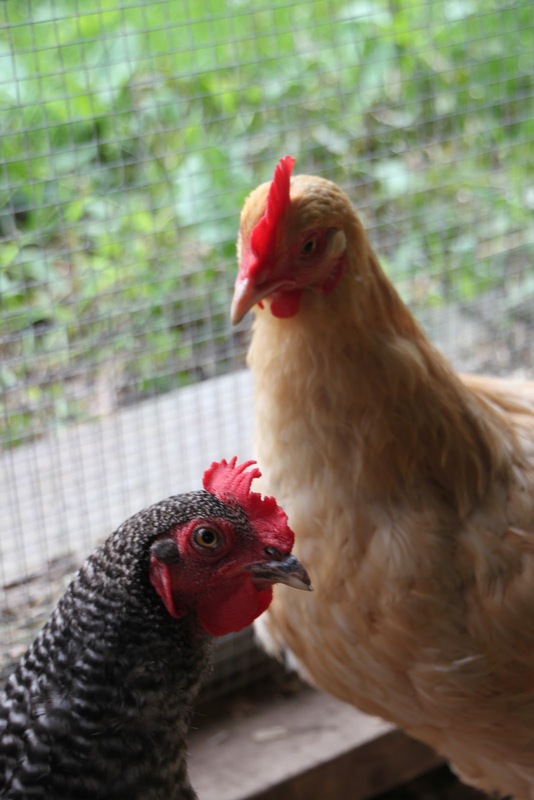 One of their chickens loves to swing on the swing set with their eldest little one. 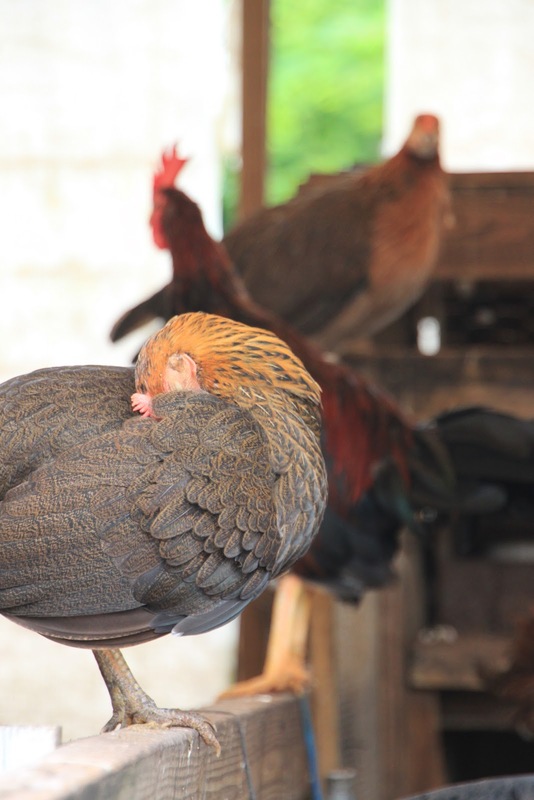 This sweet chicken below fell asleep in Mike’s arms as we chatted. Of course, my visit would not have been complete without meeting their two male call ducks, Fletch and Flash. These two are the newest members of the family. 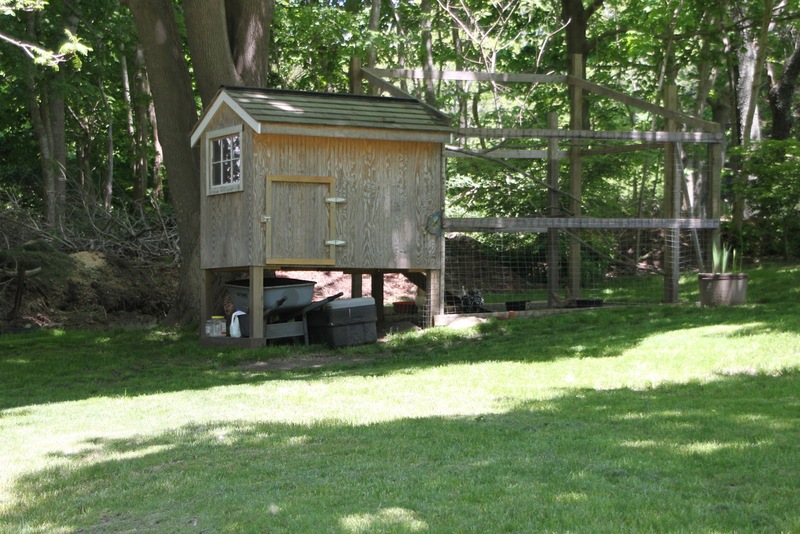 Mike and Wendy built their duck coop with left over scrap lumber and supplies from the chicken coop. It has a house with an attached run and a swimming pool just for the boys. I learned that male ducks are much quieter than females. 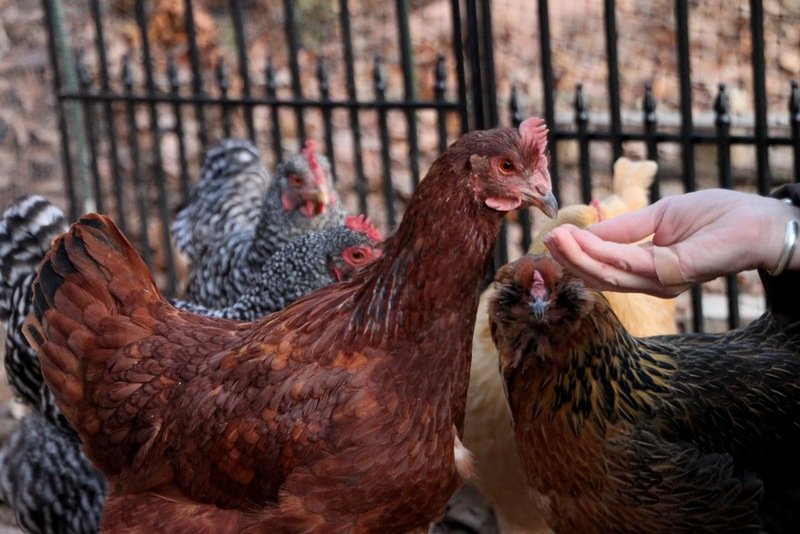 With a bit of handling, these boys should become just as docile as the chickens. Soon enough, our visit was over. They always seem to pass too quickly. It was a lovely afternoon and I was so overjoyed to see how much happiness the chickens and ducks have added to this family’s life. 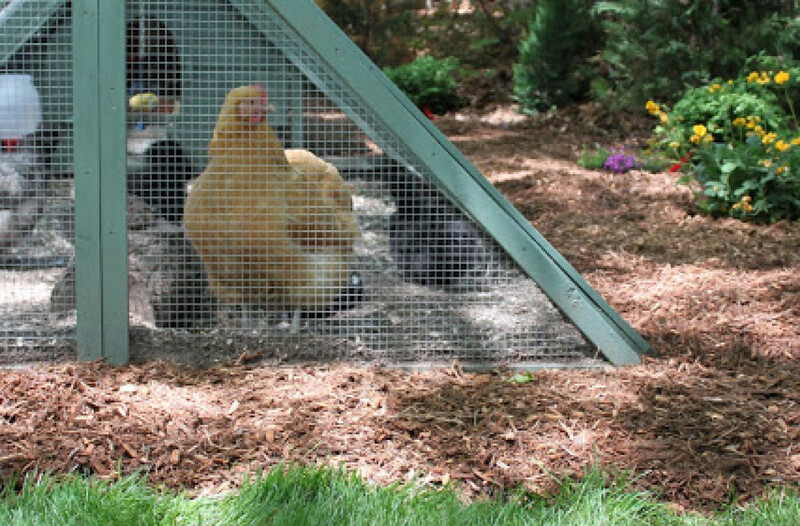 One of Mike’s friends from work plans to come over this week for a tour of Mike and Wendy’s coop and run. He too is planning on adding a flock of his own to his yard. 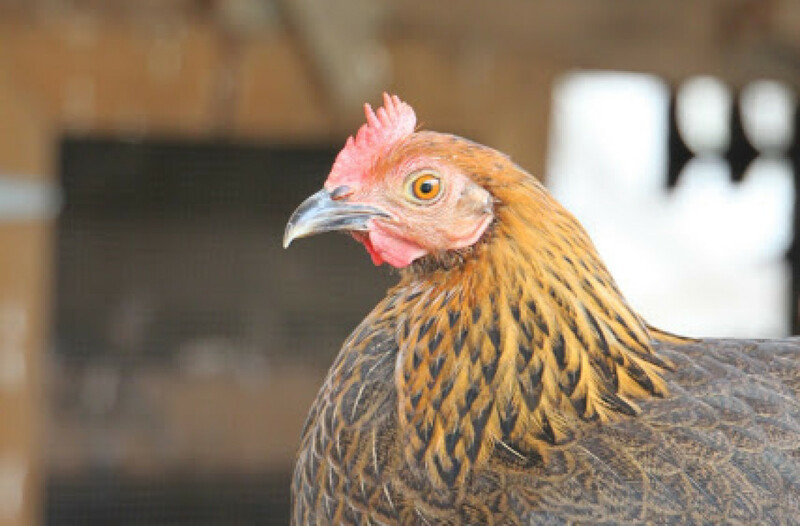 One thing is for sure, with a little inspiration from a friend that keeps chickens, it is so easy and clear why keeping a small backyard flock is not only possible but incredibly rewarding. 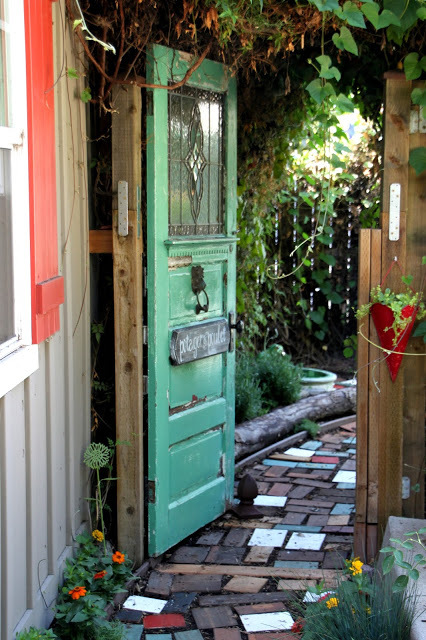 Click here for all the Tour de Coops featured on Tilly’s Nest. This post is linked up to Homestead Revival’s Barn Hop. 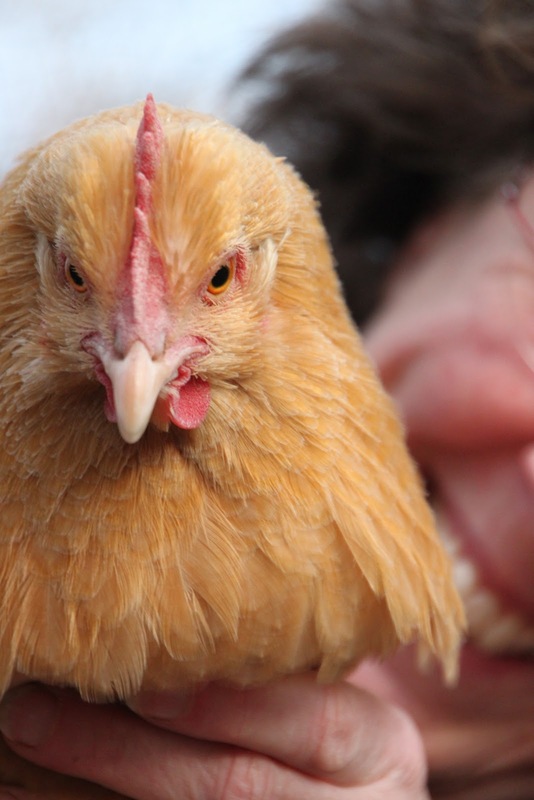 I was thrilled to discover that my new friend, Alicia, keeps chickens. 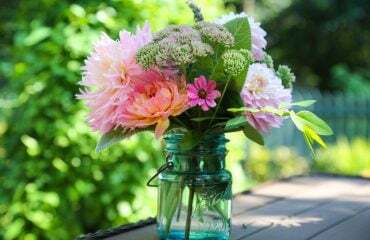 For me, it instantly adds depth to a friendship when I find out that we share common interests. I first met Alicia this past Winter when I took the beekeeping class. I loved that we immediately had so many things to talk about and stories to share. This past weekend, we went together to pick-up our bees, but first, I had to meet her girls. 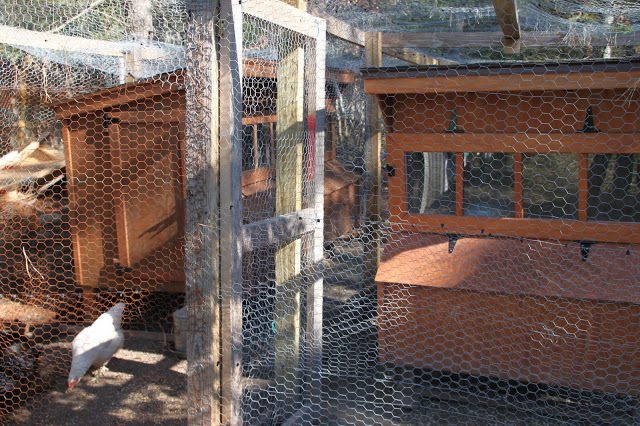 Alicia keeps two coops, one for the “mean girls” and one for the “nice girls”. 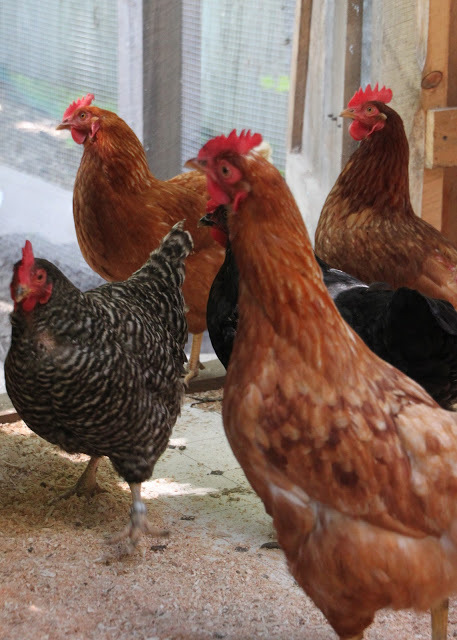 The mean girls have very dominant personalities and for a chicken, it takes quite a bit to keep up with this group. The nice girls are gentle and never worry about being dominant. They are sweet to all newcomers, including hens that Alicia helps to rescue. During my visit, both flocks were friendly. 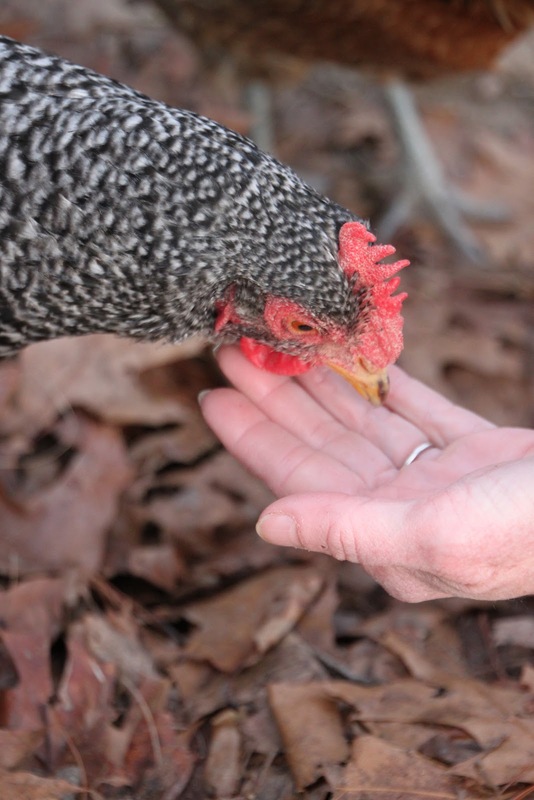 They enjoyed me petting them and I could have easily picked up most of her hens. 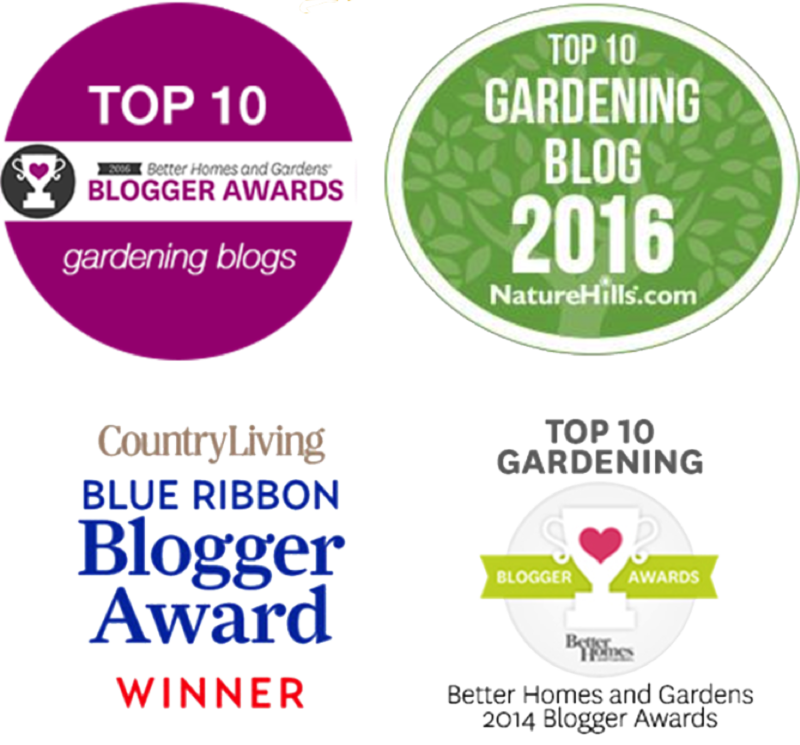 The two coops are separated from each other by lovely gardens. 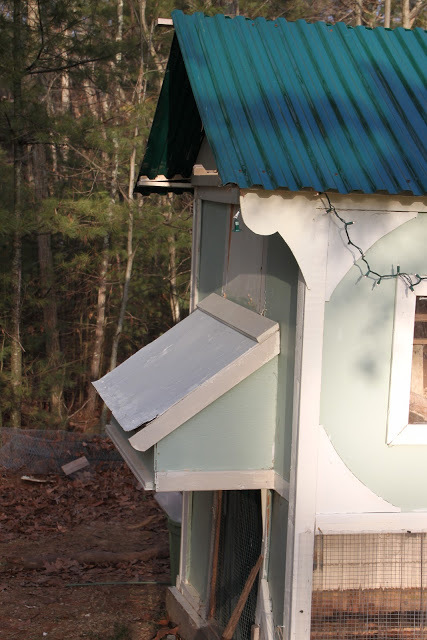 The nice girls’ coop was Alicia’s original coop that was built as a birthday present for her by her boyfriend. 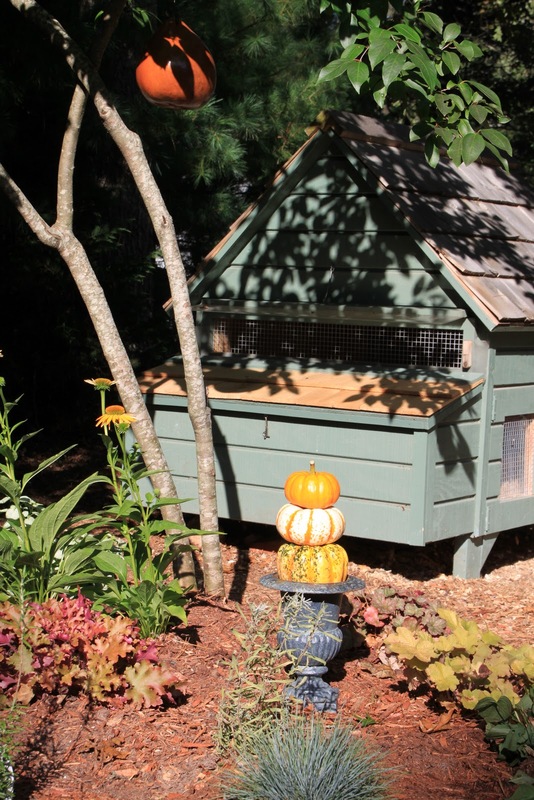 Soon enough, her love for chickens began and her flock outgrew this smaller coop. 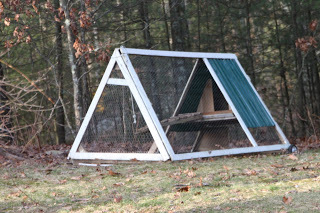 Alicia and her boyfriend constructed the new coop closer to the house. 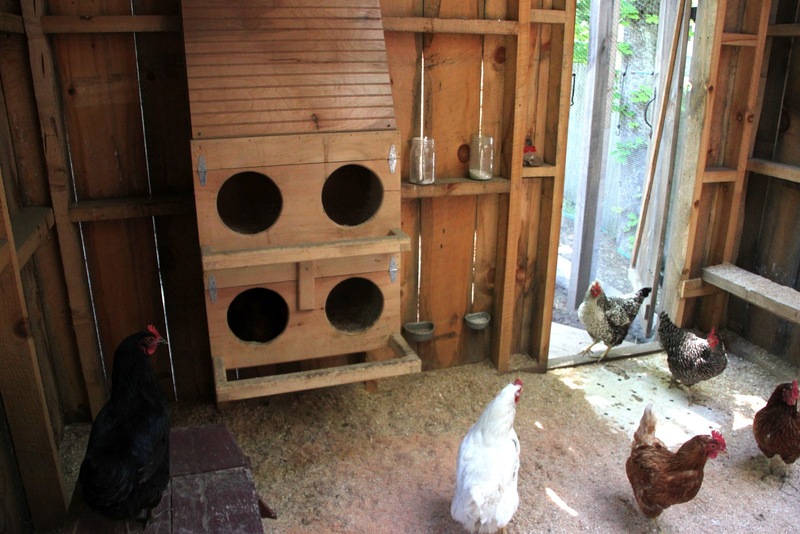 Working with salvaged lumber and windows, the new coop was born with mostly recycled materials. However, as new members were added to the flock, it was clear that some sweet girls would do better in a home of their own. So, she split the flock and they are now happy living separate lives. 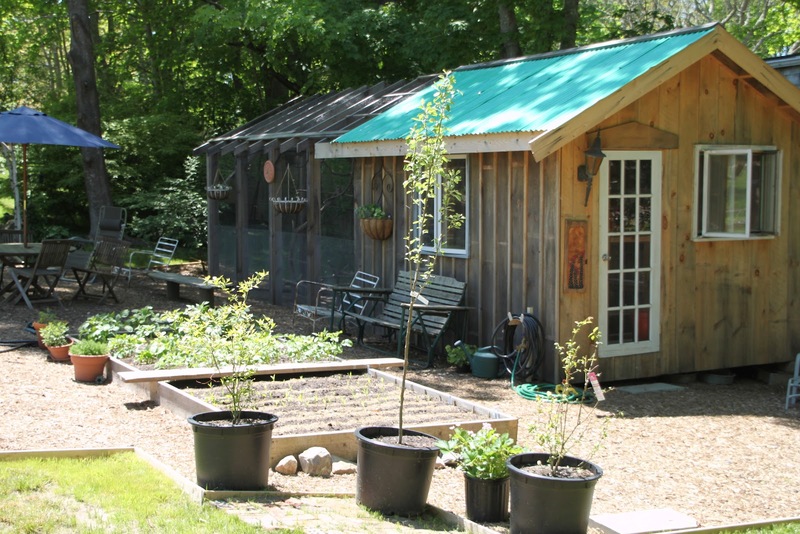 Beautiful raised garden beds and lovely seating areas surround the coop making it a lovely spot to sit in the dappled sunshine. 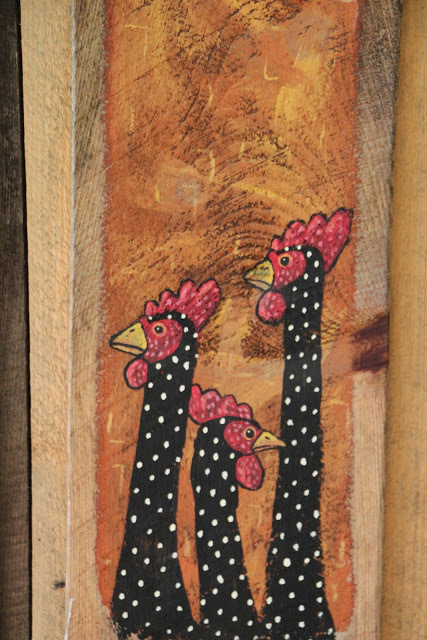 As you prepare to enter the coop, a sweet painting greets you. It’s hard not to smile. 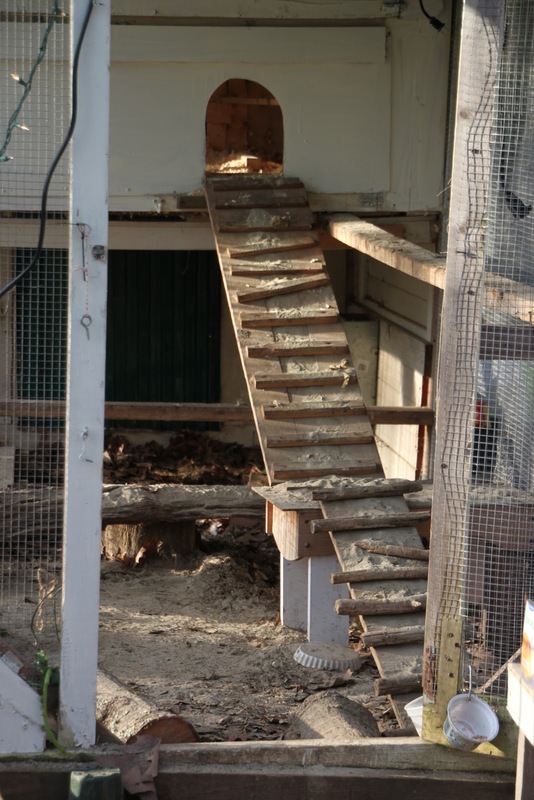 Once inside the coop the front entry is partitioned off with chicken wire. This serves as a storage area. 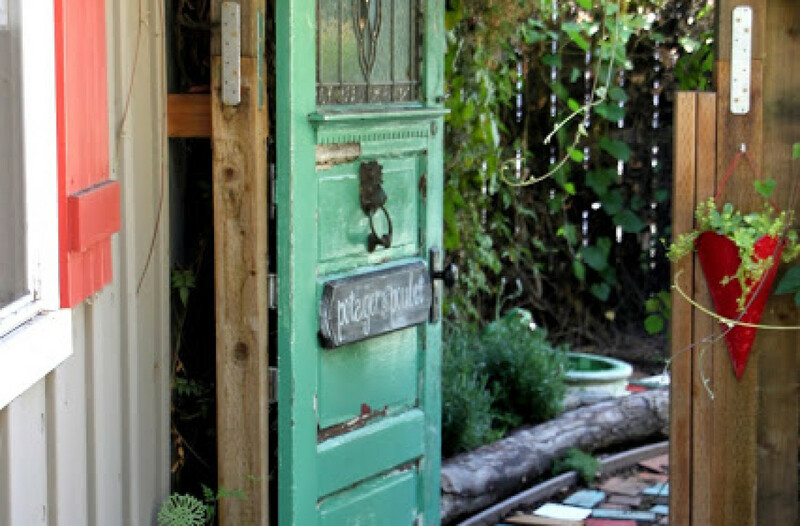 A door immediately in front of you, that was recycled from inside their historic home, serves as the point of entry. Immediately, I was impressed with all of the beautiful natural light that filled the coop. The entire back side of the coop’s roof is made of clear corrugated roofing. 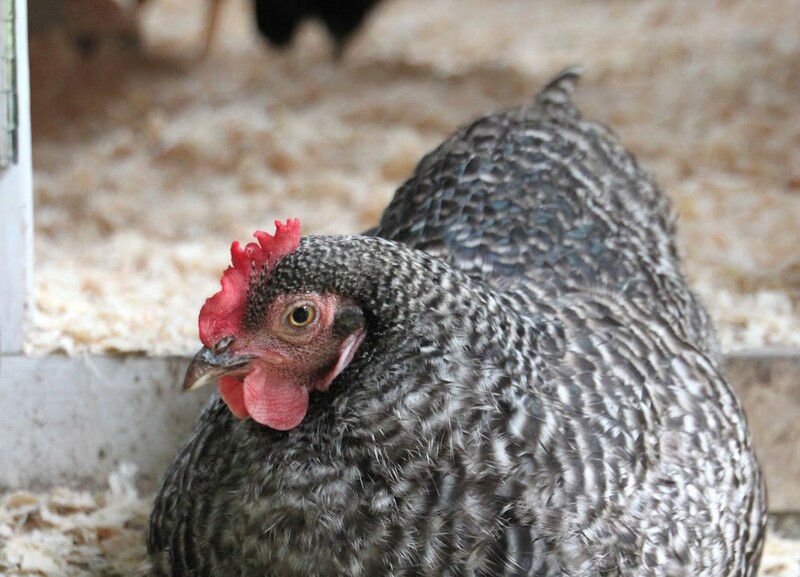 Alicia tells me that often she finds her girls napping inside the coop just basking in the sunshine. 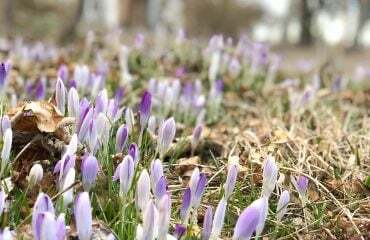 It is also great on Winter days. 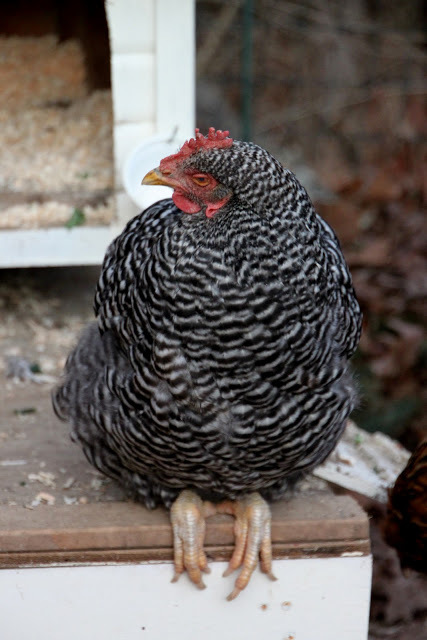 The hens love finding a bit of sunshine when snow is outside on the ground. 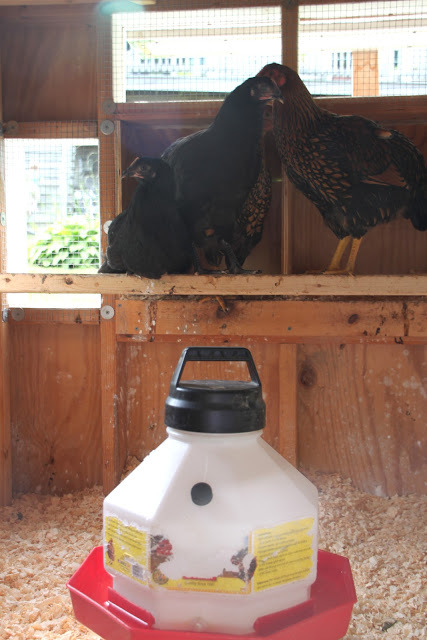 Inside the coop, on the wall next to the nesting boxes, the hens have access to small containers of grit and oyster shells. Their food and water is out in the run. 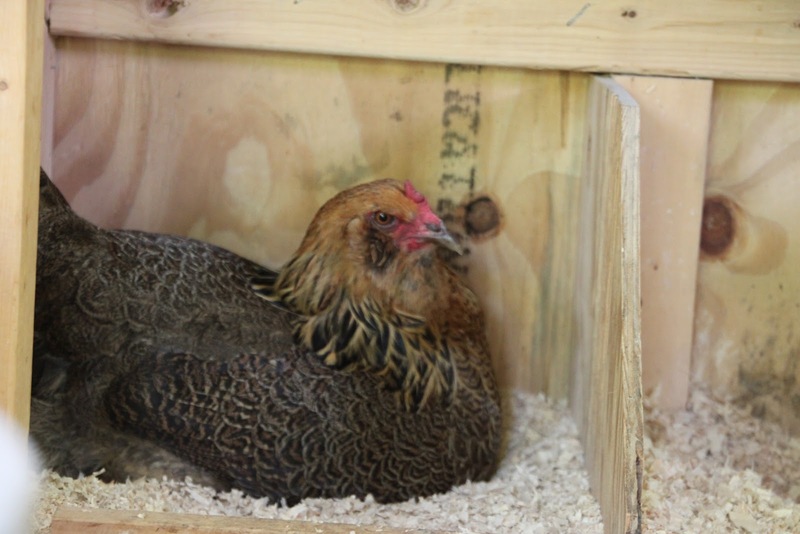 The nesting boxes are cleverly designed. 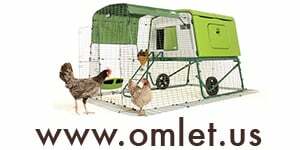 They have hinges and locks that twist allowing the entire front of the boxes, roosts and all to lift up for easy cleaning. 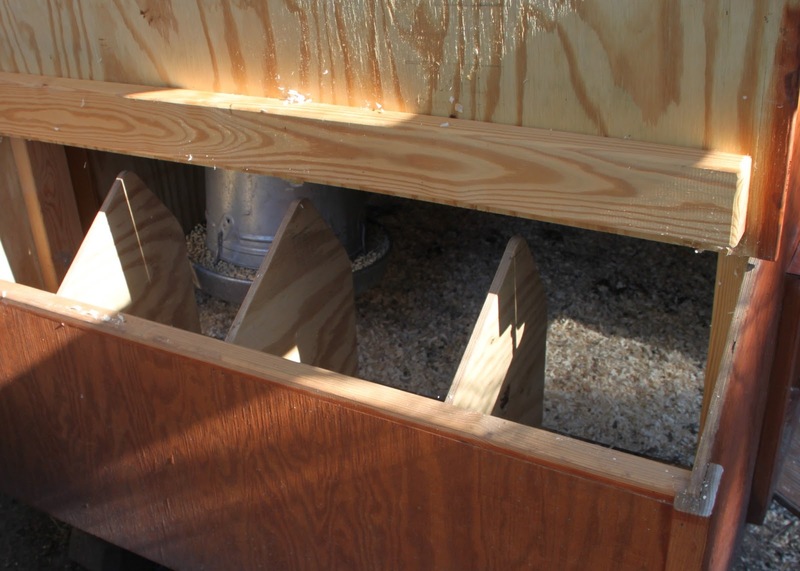 Circular entry holes were cut into the fronts of the boxes, to prevent the hens from kicking out the shavings. The girls were anxious to show me their run. I soon learned why. Outside in the run was the most magnificent jungle gym for chickens that I had ever laid my eyes on! The hens love to play on it all day and it helps them to get high up into the rafters where they enjoy roosting during the day. Alicia’s flock is beautiful and is made up of an assortment of colorful breeds. 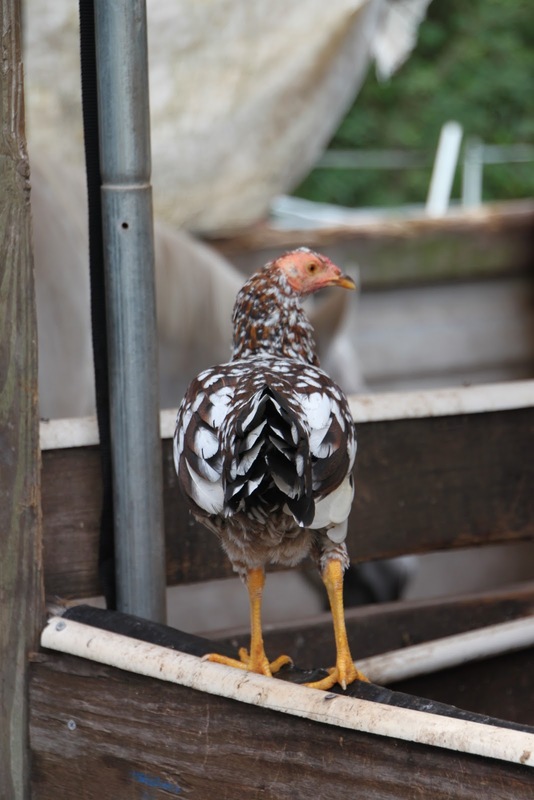 She even has a Silver Laced Wyandotte that is probably Dottie Speckle’s sister. You can see her in the background of the second photo below. Soon enough, it was time to meet the nice girls. Four sweet hens live at the top of the hill in the nice coop. 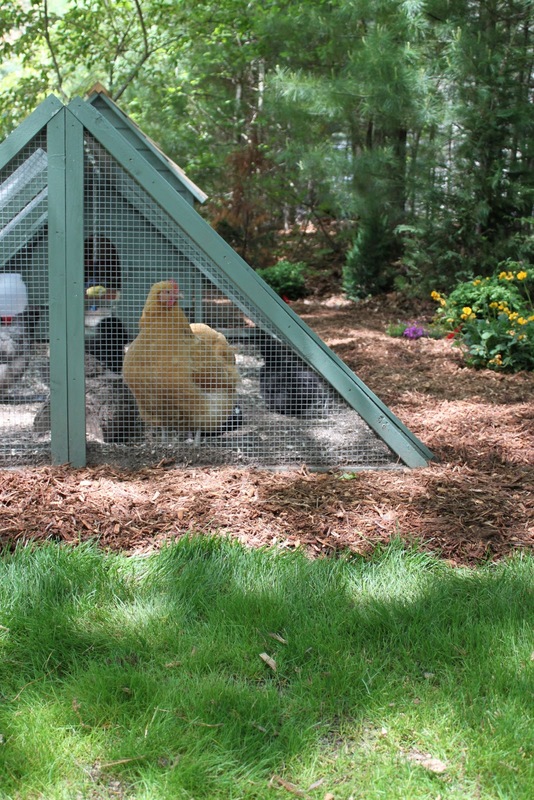 They have all the same luxuries in life as the mean girls including a miniature chicken jungle gym. 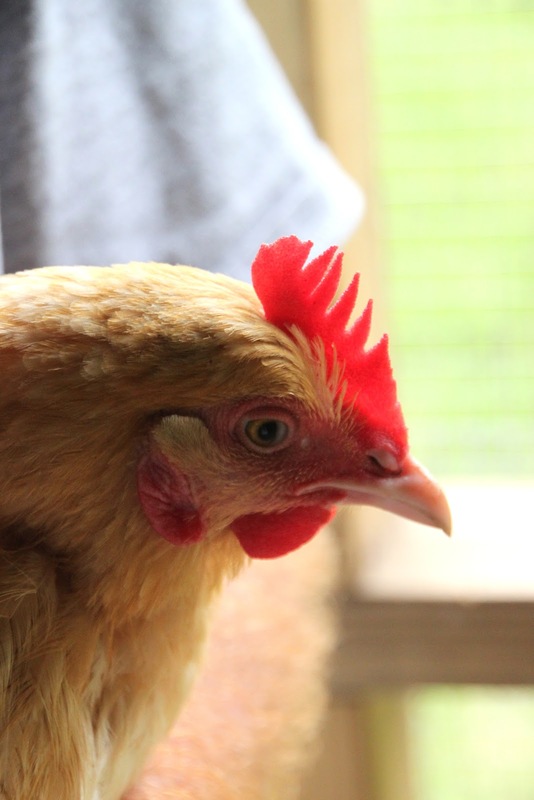 We were immediately greeted by her sweet Buff Orpington. Inside the coop we met her broody girl, who according to Alicia, is always sitting on eggs. We discovered four underneath her when she got up for some meal worm treats. It was amazing as the energy in this coop up top the hill was very different. It was laid back as opposed to the high energy that I felt in the other coop. 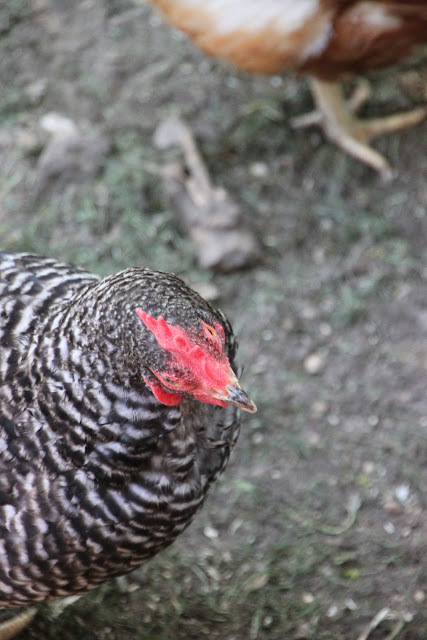 Personalities seemed well matched in both her flocks. I love how she was able to create two distinctly different flocks and chicken coops all in the same yard. This is a great solution to problems that most chicken keepers encounter. 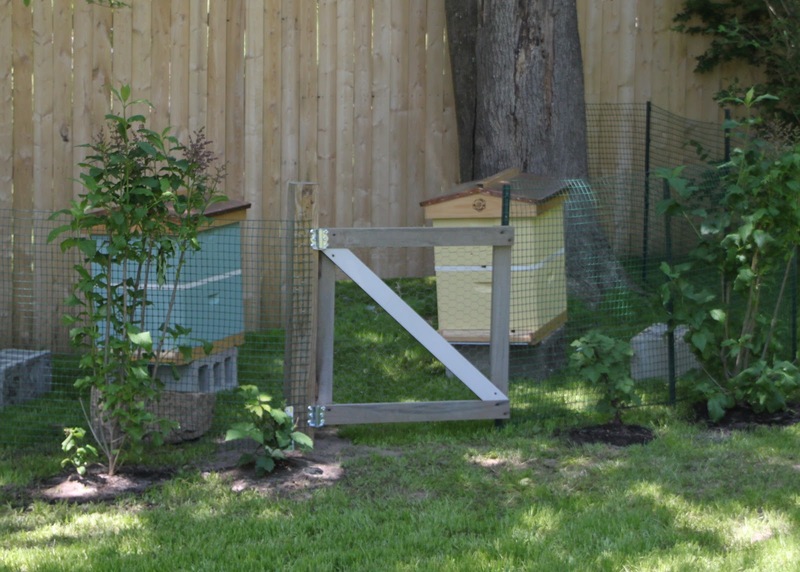 Of course, I could not do this Tour de Coop without sharing you Alicia’s beehives. Here they are sectioned off in between the two coops on the side of her yard. 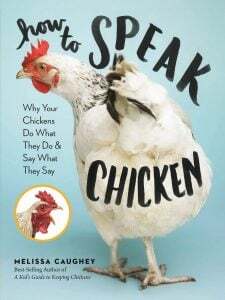 Lauren Scheuer and I have become great friends over our common love for chickens. We spoil our girls. 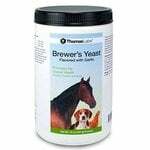 We love them deeply and are constantly entertained by their antics. So, you can imagine my excitement when I finally got to meet the girls I knew so dearly through her blog! 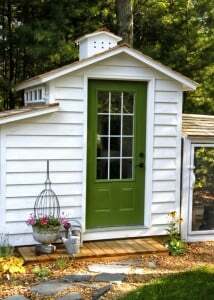 As we stood in her kitchen, there out across the backyard was her beautifully constructed coop. Lauren designed it herself. 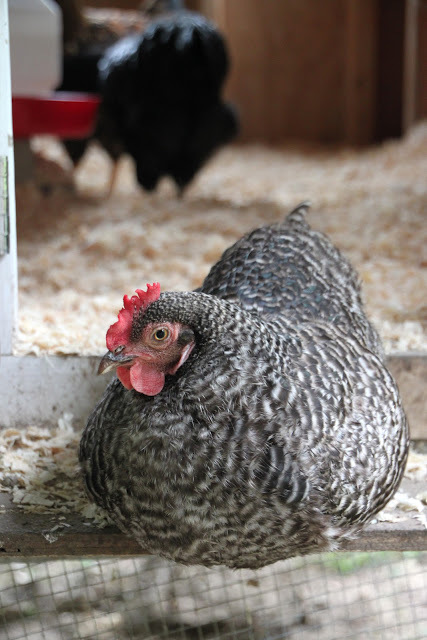 She has made many coops since keeping chickens and this one seems to house the girls perfectly. The thing I love about Lauren is she is very talented with power tools and design. If she envisions it, she builds it. Her menagerie of girls have many different ways to explore and enjoy life. 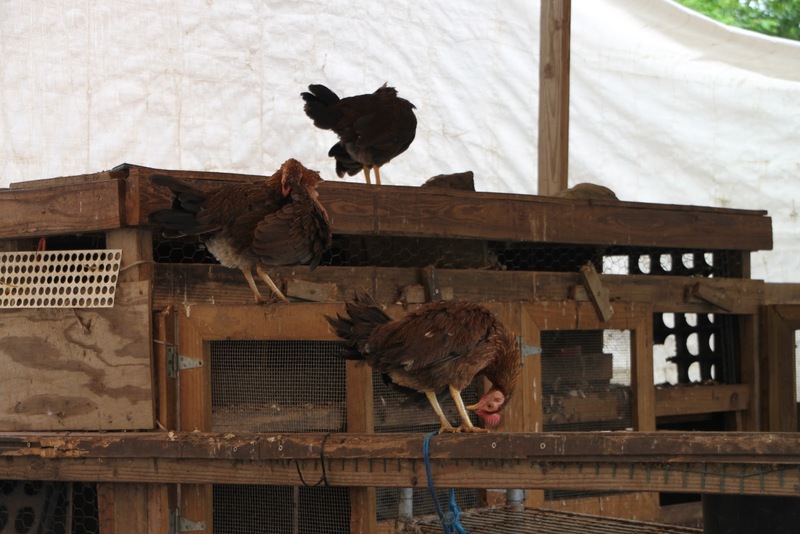 They have a chicken tractor, they have various mobile pens and they have a fantastic guard dog named Marky. Marky is the girls’ protector. He watches over them when they are out and about. 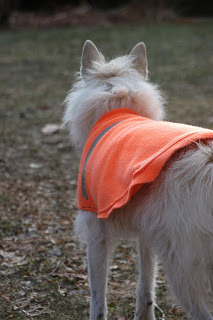 He warns them of imminent danger and takes his job very seriously. It was a cold January morning when I met the girls. There they were; Fern, Pigeon, Lucy, Daisy and Lil’ White. Lauren shared some treats as an icebreaker. 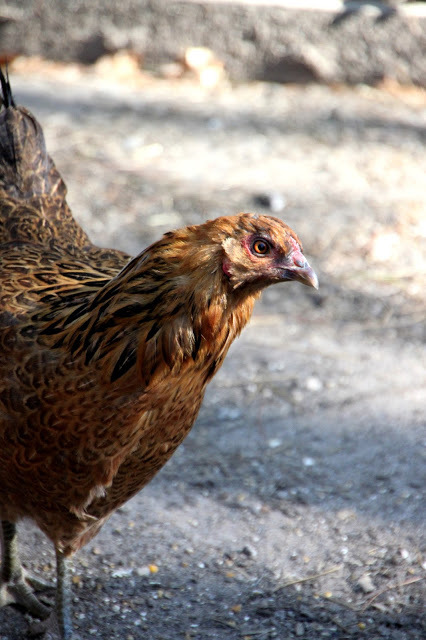 At first they were afraid of me, until I squatted on the ground in the run and said hello in my best chicken voice. Somehow, the language is universal and they all came over one by one to greet me. 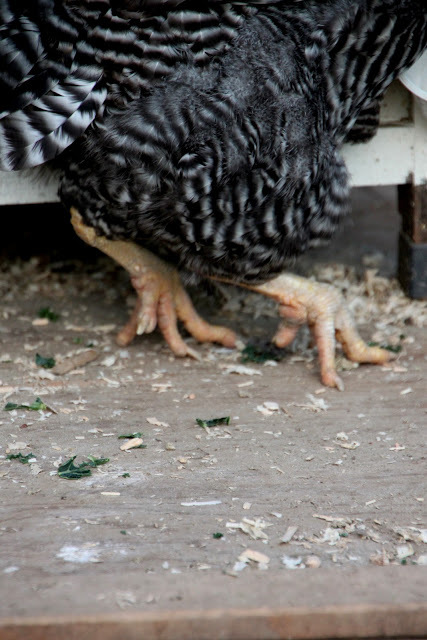 Lucy is Lauren’s special needs chicken. 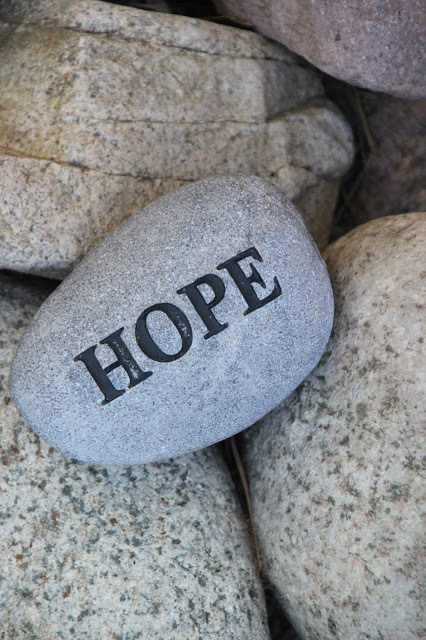 Years ago, seemingly overnight, Lucy was afflicted with Marek’s Disease that affected her feet and her ability to walk. I believe that it was Lauren’s love and special attention to this girl that gave her the will to survive. Over the past couple of years, Lucy has regained the ability to walk, yet is crippled, slow and very methodical. During my visit, she walked across the run to meet up with Lauren at her sweet little house made just for her. 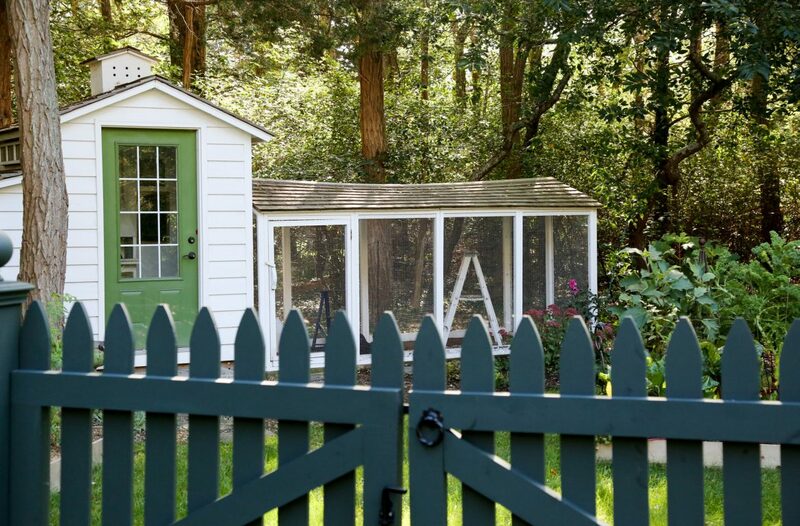 Sometimes she prefers to stay inside this tiny house. 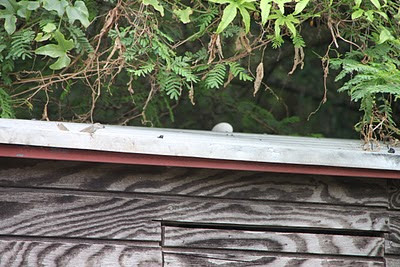 Other times, she can be seen perched on the edge of the platform with a bird’s eye view of the yard, run and her family. I think her favorite thing is to hop up onto Lauren’s forearm and go for a ride. 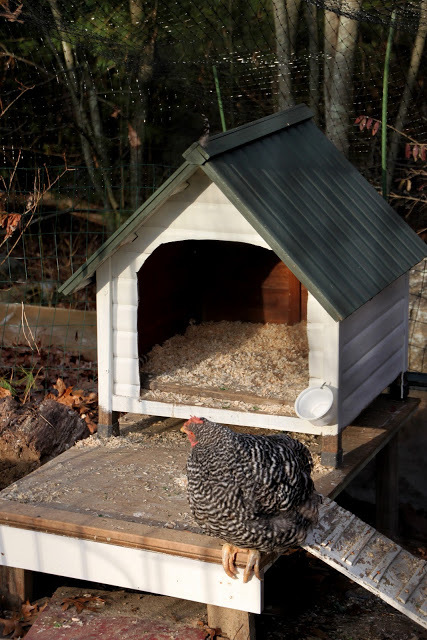 Lauren has designed her coop with great attention to detail, both decorative and practical. 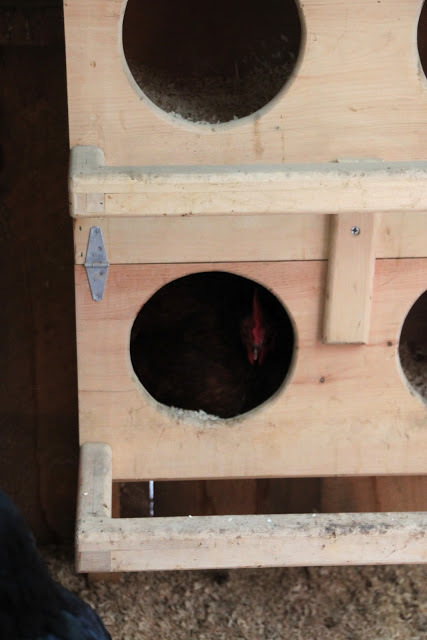 She has included outside nesting boxes for easy egg harvesting. 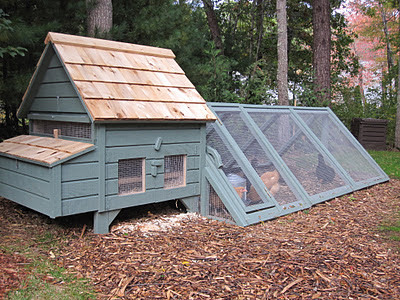 Her run and coop are covered and are designed with an A-frame roof. 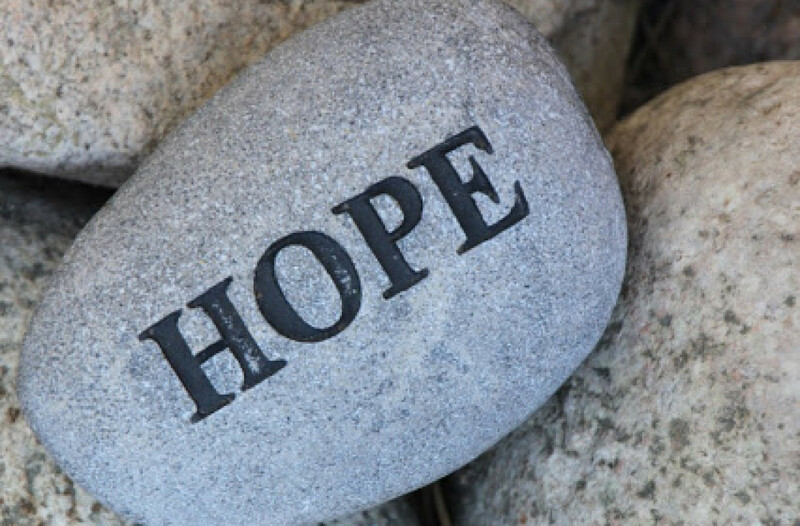 It is perfect for rain and snow to melt away and never create too much weight. 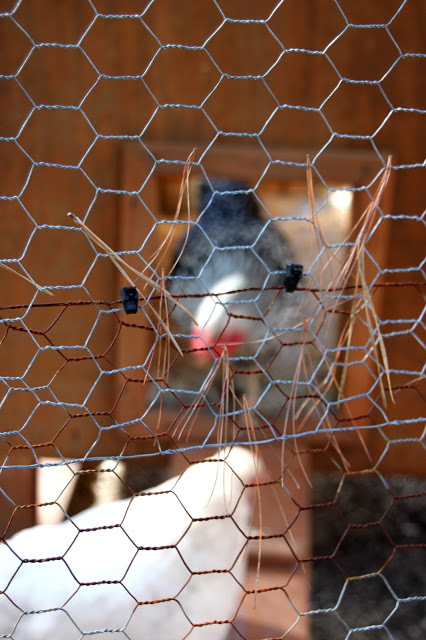 She covers the hardware cloth with plastic sheeting in the Winter to help minimize the girls’ exposure to the elements. This also serves to keep the portion of the run closest to the coop sheltered. A ramp leads up to the entry door of the coop. A heated dog bowl in the covered run keeps their water from freezing in the winter and food is available at all times. Play things are abundant including logs, treat containers and perches. Lauren tells me that her best idea was adding play sand to this portion of the run. Inside the coop, there are a variety of perches of different widths and heights to meet every chicken’s desire. Lauren uses pine shavings on the floor. Despite her best efforts, poor Fern always needs to retire at night with the help of Lauren. 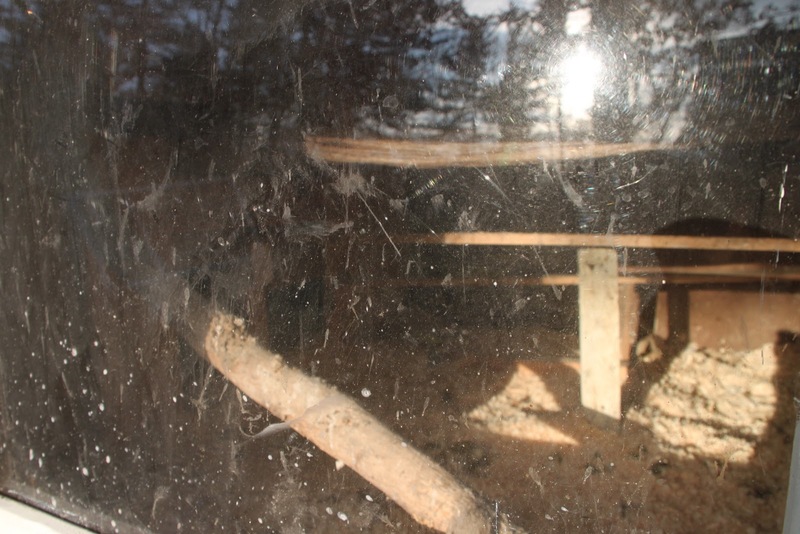 The coop has a large window that faces the morning sun. It is perfect for early risers and wonderful to give outsiders a glimpse in. 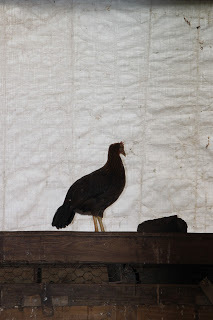 Soon enough, the cold began to nip at our noses and we needed to return inside to the warmth of the house and get ready for our day trip to the Poultry Congress. Lauren reminded Marky of his chicken duties. I watched the two of them communicate without words. It was clear he understood. If you would like to see more of our Tour de Coops, click here. 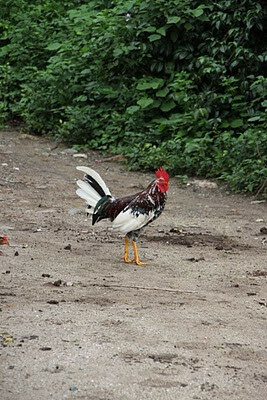 St. John had many wild chickens roaming everywhere. 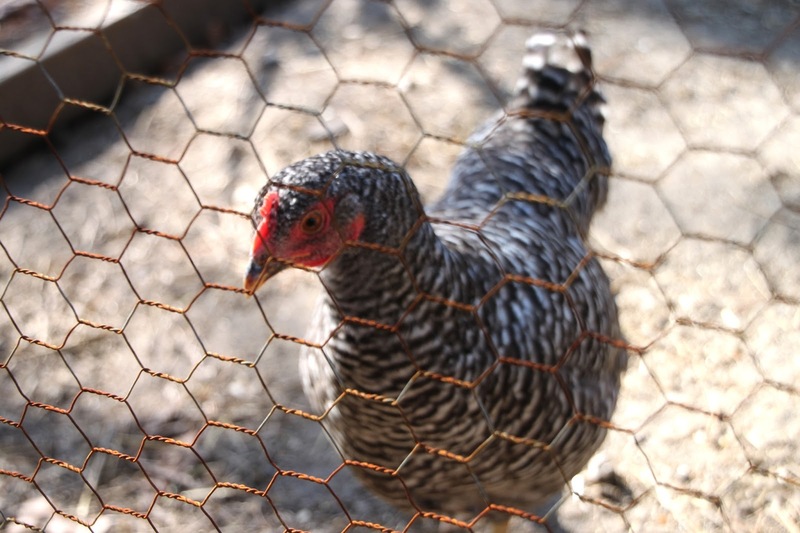 After a few days on the island, it soon became clear to me that most likely not many people kept backyard chickens. However, a girl can try. I searched everywhere I could trying to discover and share a Tour de Coop. 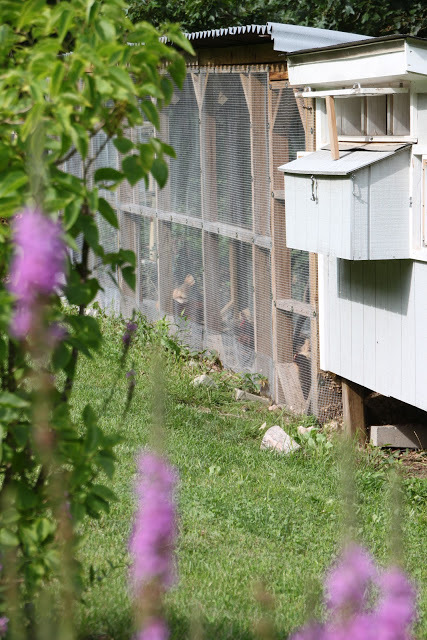 I watched as homes whizzed by as we were driving, hoping to catch a glimpse of a small coop tucked away in someone’s yard. I did not have any luck until my husband and I decided to go horseback riding. 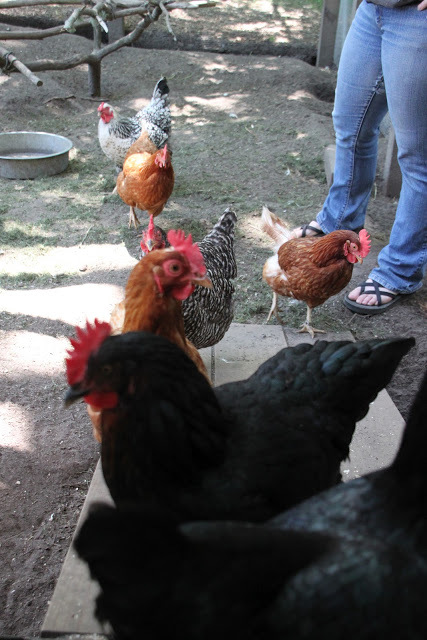 We met Dana and her menagerie of wonderful animals including donkeys, horses, goats, cats and, finally, chickens. 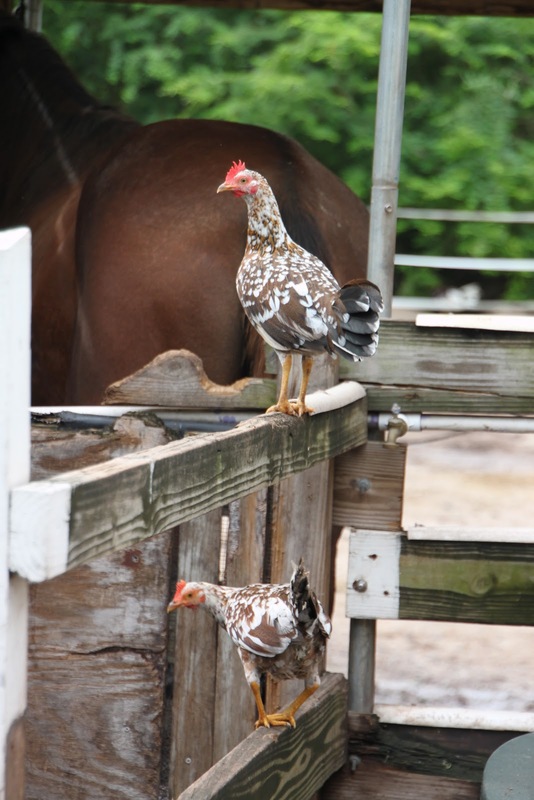 As Dana saddled up our horses for our hour and a half scenic tour, I could not help but interact with her chickens. Some she raised as chicks and some just happened to show up. She has a few roosters and one in particular that likes to follow her around. For the most part, they are skittish, like those in the wild. Dana allows them to roam free on her property. She has a coop and nesting boxes in a small corral with a couple of goats. 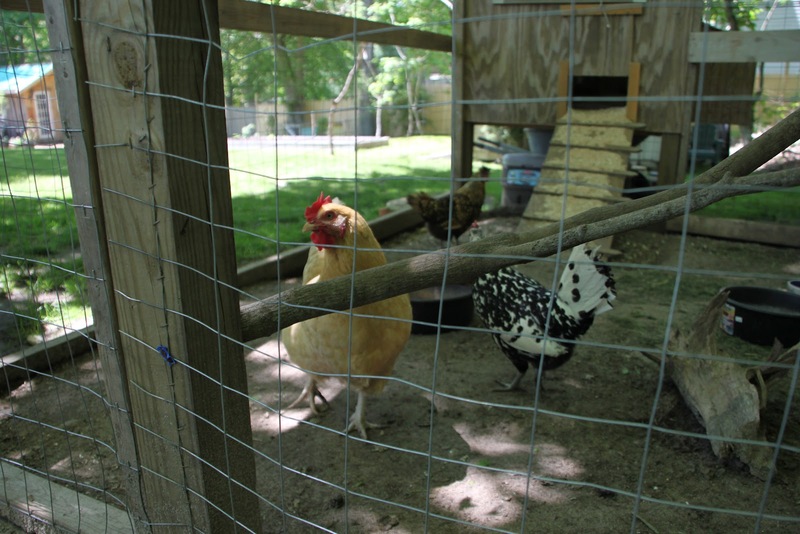 The chickens know that there is a supply of fresh food and water here and that keeps her flock nearby. The chickens and the goats actually get along pretty well, but the goats have been known to interrupt egg laying. Some of her hens prefer to lay eggs outside of the boxes and coop area. Dana has found clutches of eggs here and there. 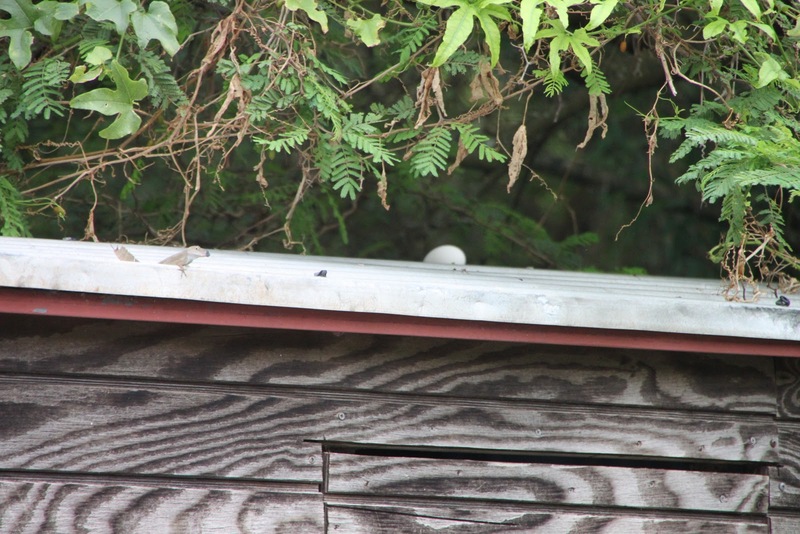 On the day of our visit, she spotted a tiny white egg laid on the top of her roof! 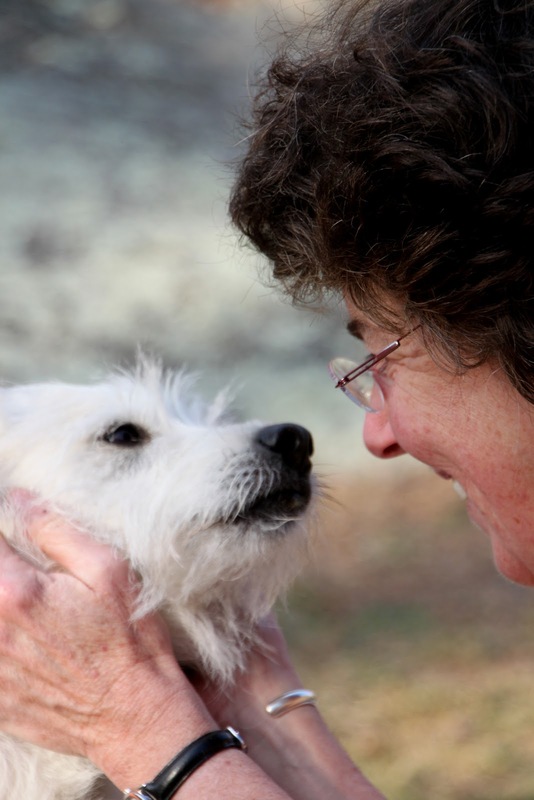 It was heartwarming to meet this woman with such a wonderful heart and compassion for animals. Some of her animals are rehabilitating from injuries. Some cannot return to the wild. A few of her horses are in their retirement and spend their days interacting with other horses and taking visitors to view amazing vistas and island scenery. We had a wonderful time. The horseback riding was fantastic and I encourage you to visit Dana and her animals if you are ever visiting St. John. 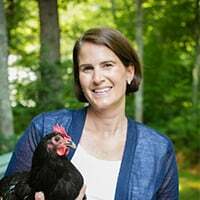 You can read more about Dana, her company and her animals here.